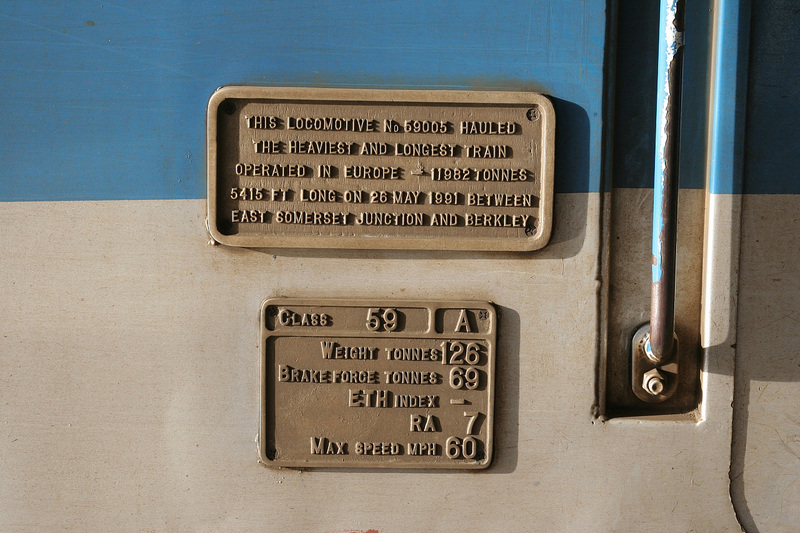 Nameplates these days are not quite so permanant as during older times when Locomotives were often named just once,lasting their entire life span.Today however things are a little different with some engines seemingly exchanging names every couple of years.Some of those pictured still exist but some have already been removed or replaced. 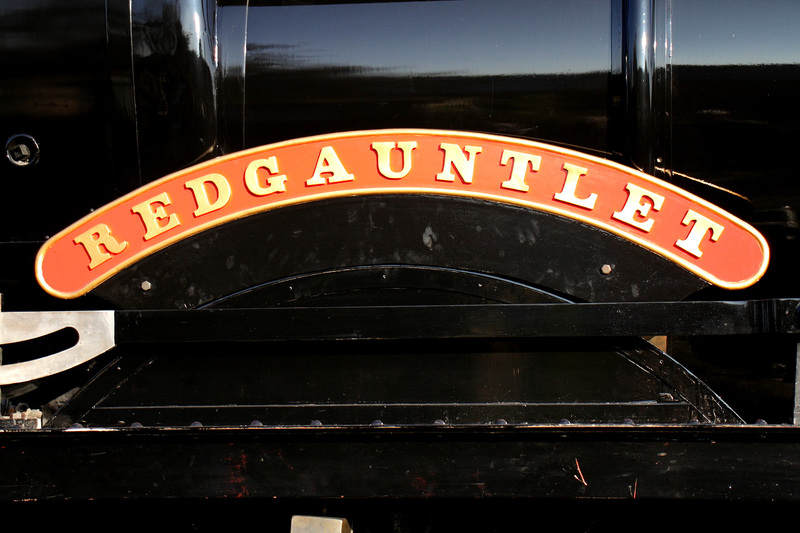 This is an original 'Redgauntlet' nameplate that is temporarily fitted to 2999 the GWS's replica 'Saint' locomotive that is yet to moved under its own steam,although that is now only a few months away! 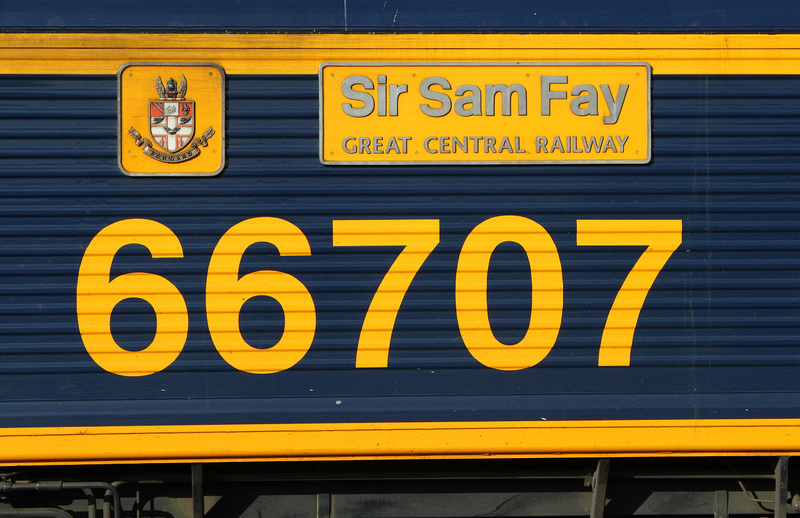 A close view of the cast alloy plate & plaque 'Sir Sam Fay-Great Central Railway' carried by GBRf's 66707.Seen whilst stopped briefly at Westbury. 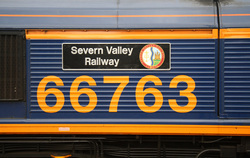 This is a good look at the new logo just applied to the reliveried 66413.The livery is almost the same as applied to this companies many locomotives around the world particularly the USA ones.A very pastel-orange. 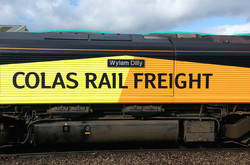 Certainly a good livery to picture in less than 'full-sun' conditions.The UK Freight scene has never had so much variation in liveries.We live in very colourful times! 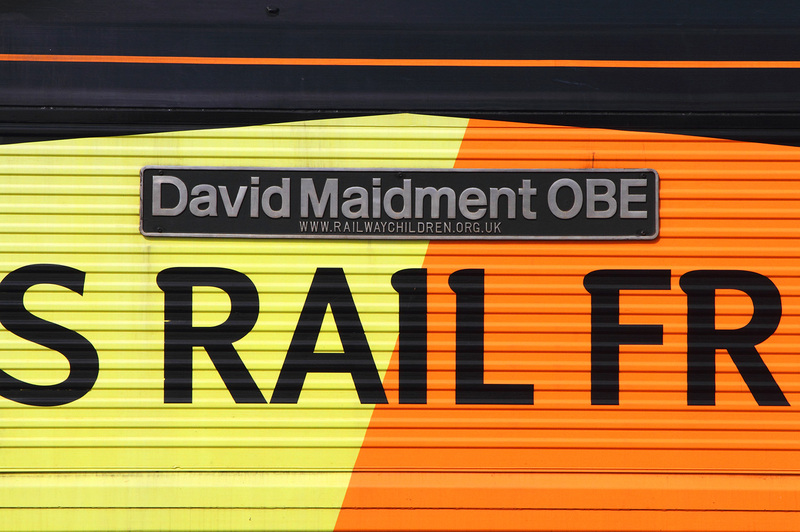 Another loco on the 'Line', adjacent to Eastleigh Station was GBRf's 66732.Here is a shot of its quite large self explanatory nameplate. 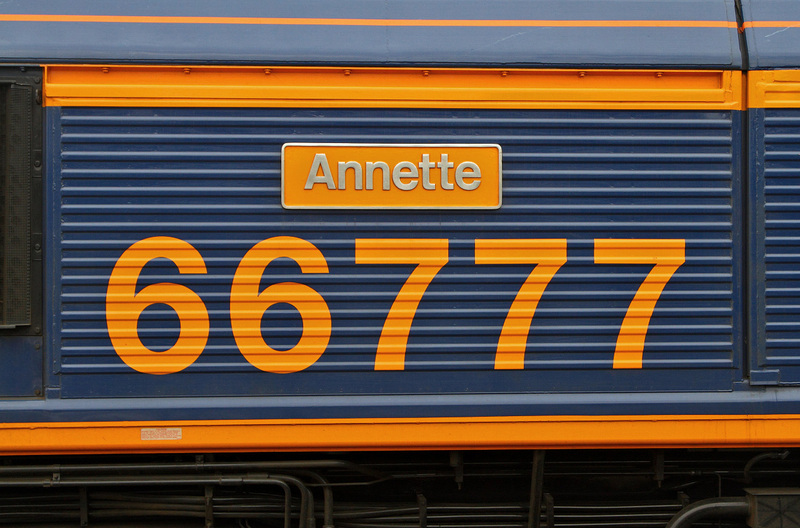 This is the nameplate of 66777 at Westbury just prior to departing with the 24hr delayed '6M40' from here to Stud Farm. 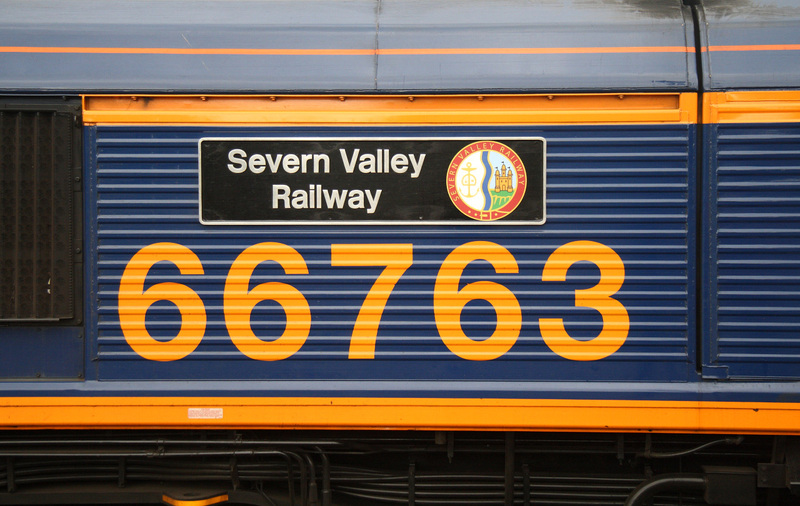 Note the old Signwriters trick of enlarging the 6's to give the illusion of all numbers being the same height when if fact they are slightly larger! 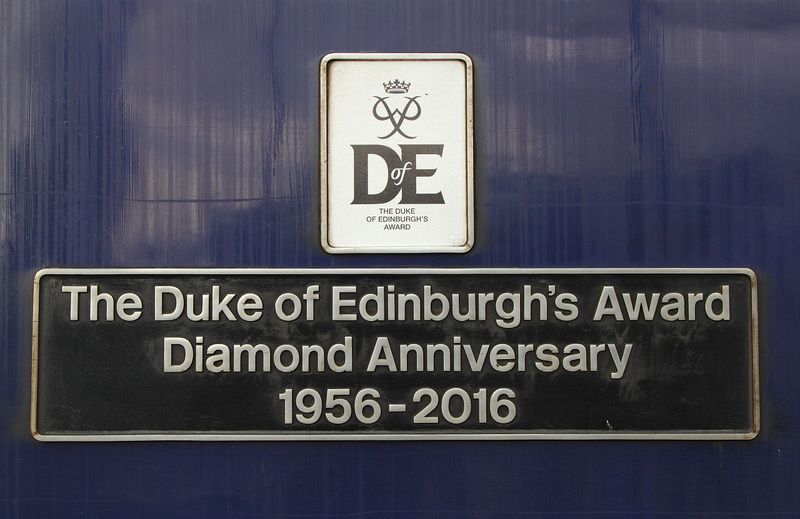 Here is the current nameplate on Class-43 Power Car 43022.No doubt when it comes off lease in the near future for further use,probably in Scotland this set of plates The Duke of Edinburgh's Award Diamond Anniversary 1956-2016' will be removed.A pity as it is a nationally relevant plate! 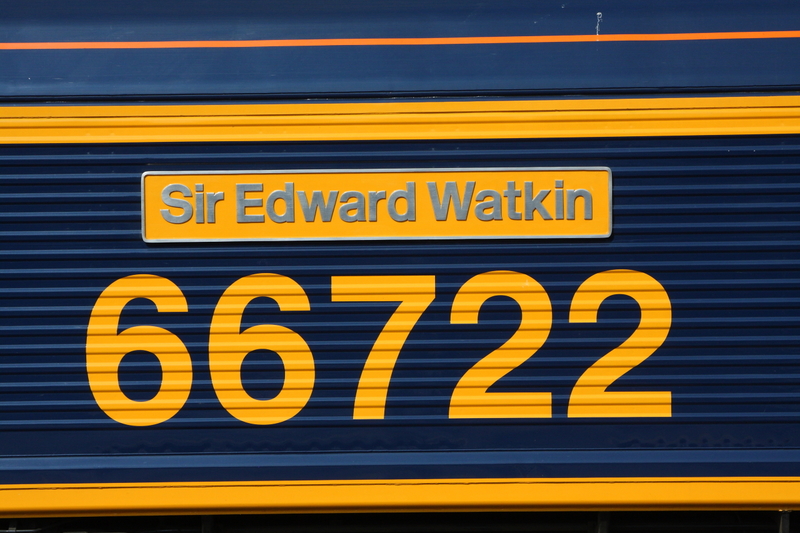 This is the nameplate affixed to the flanks of 66055.This frenchman was responsible for creating the ECR Company that operates in Europe using many of the EWS-Class 66's sent over there quite a few years ago.This gentleman was eventually to rise to the rank of CEO.He departed the Company in September 2016 and this loco was named in Feb-2017 in his honour. 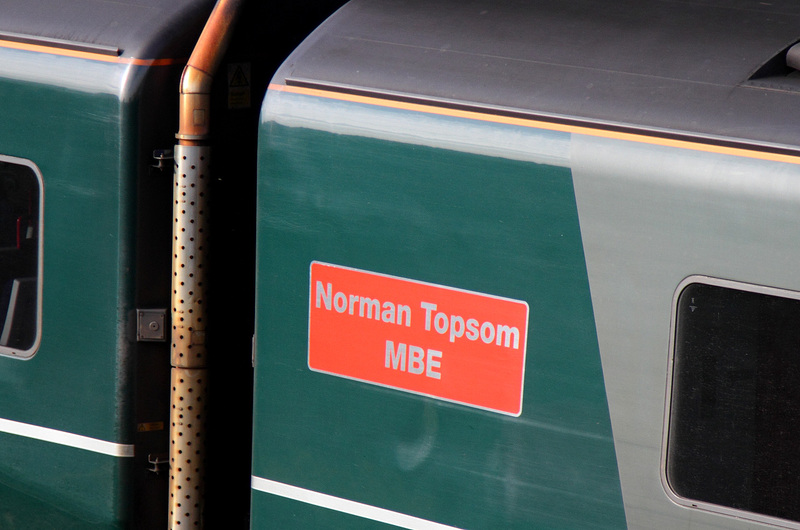 'Norman Tossom MBE' who used to work at Twyford Station in the Thames Valley.Known as 'Mr Twyford' he retired in Nov-2015 after 53 years service on the railways.Shame he won't be seeing this Unit named after him much if ever now at Twyford due to it now working out of Bristol locally only. 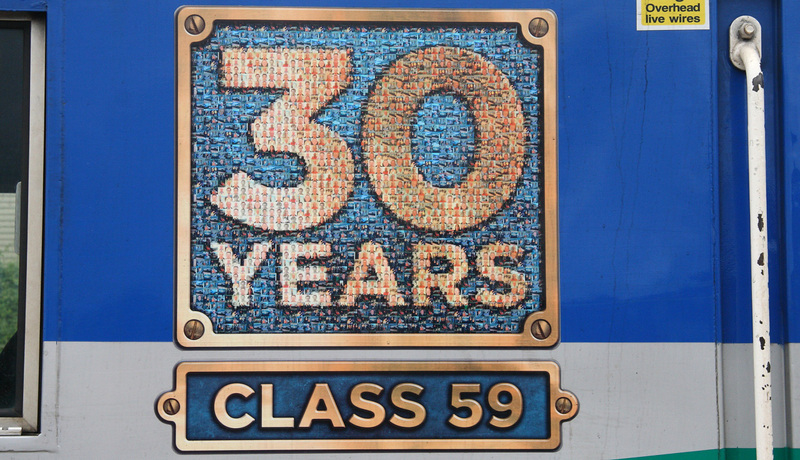 Western/Class-50 and an HST.All legends without a doubt.Then a Class 180 DMU ??? 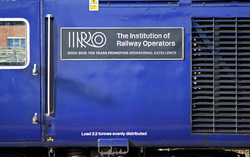 and lastly an IEP. 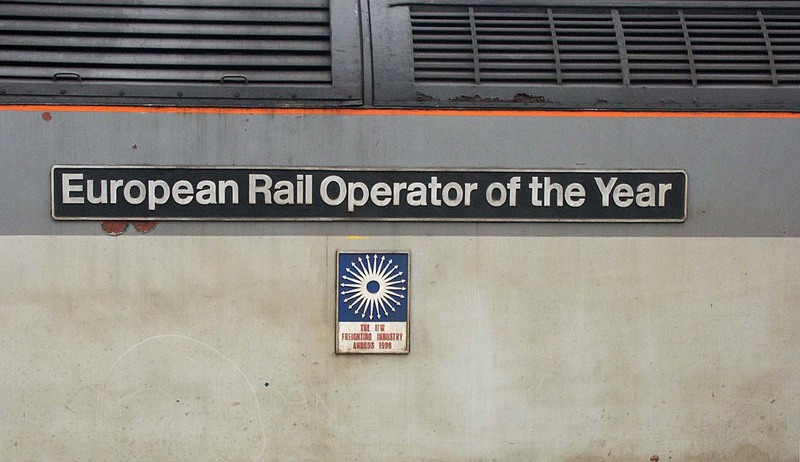 For sure the IEP electrification programme will go down as a legend alright for being the most massively over budget over engineered over hyped probable failure since the GWR started way back in the 19th century. 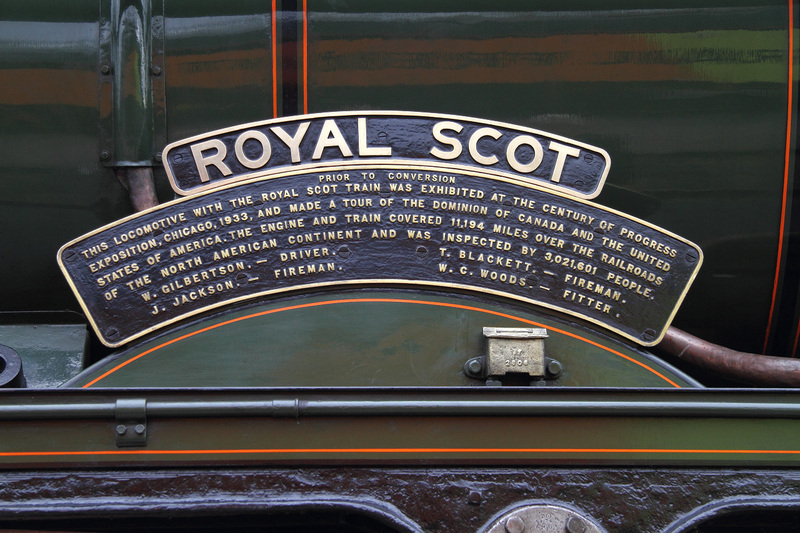 This plaque was noted fitted to 43013.It is identical to the ones affixed to Pioneer 43002 when it was returned to original styling and unveiled at the Bristol-SFM Open day on 2 may 2016.This particular engine 43013 was also there,perhaps it got its plaque at the same time ? 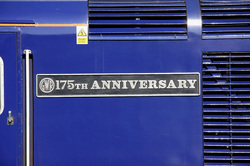 Viewed at Gillingham Station whilst it was working '1Q23'. 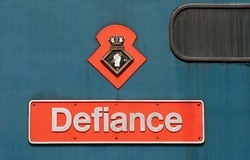 livery of the loco.All very colour co-ordinated! 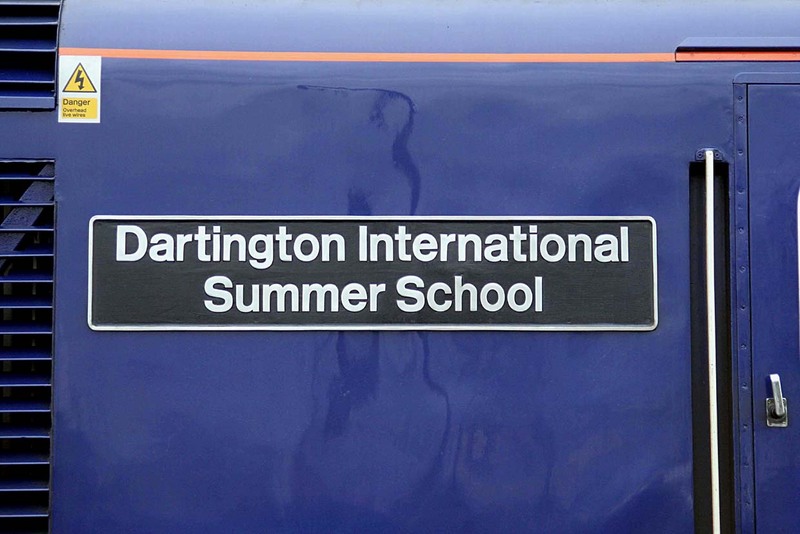 pictured.The plates are cast in the style of the Southern Railway BB- Class air smoothed bullied pacifics that carried many of these much respected names after Squadrons/Aircraft and People. 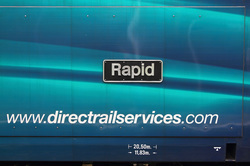 68004 was leading '1Q23' from Exeter to Salisbury and whilst it was waiting 'time' at Gillingham there was plenty of time to walk to the other end of the train and picture 68004's 'Rapid' nameplate as well.No mistaking the owners of this new generation locomotive.Why not 'log-on' and wallow in the DRS propaganda?? 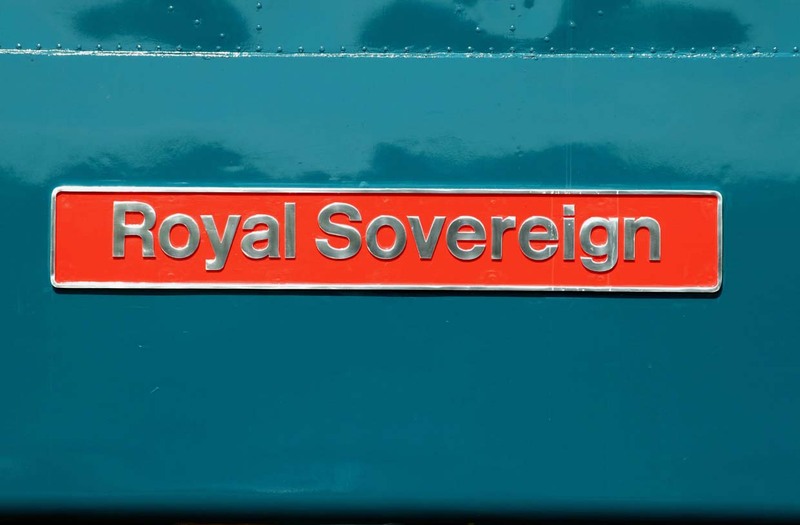 68020 was waiting 'time' at Gillingham before proceeding onward to Salisbury,hence the chance to picture its cast allot nameplate 'Reliance' which has a definite 'feel' of the older Class-50's being named after a Royal Naval Vessel as they were mostly.They of coarse used to ply this route down to Exeter many years ago.Note the plates are just secured by 'pop' rivets.Not very secure in my opinion. 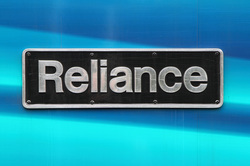 60-seconds with a good drill and the plate could be removed-just like that! 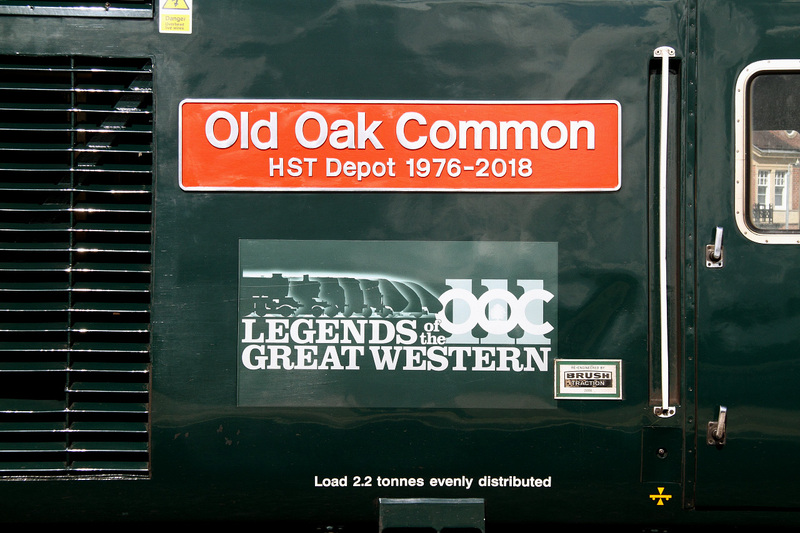 Here is the commemorative plaque affixed to 59002 'Alan J Day' celebrating 30 years on continuous haulage by these privately owned locomotives out of the Mendip Quarries.Can it really be that long? 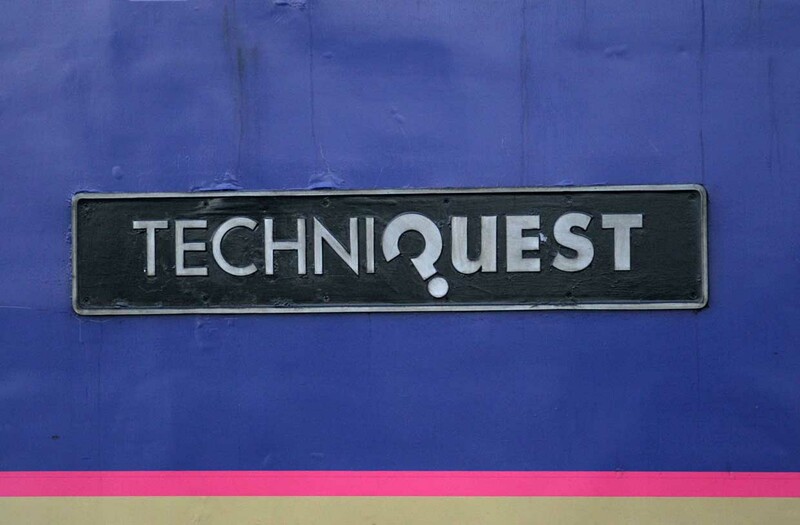 The 'mosaic' effect is a montage of presumably employees of FY/AI over the years.Sadly the effect is somewhat spoiled by the fact that both of these plaques are in fact just 'stickers' and not cast plates after all..A pity! 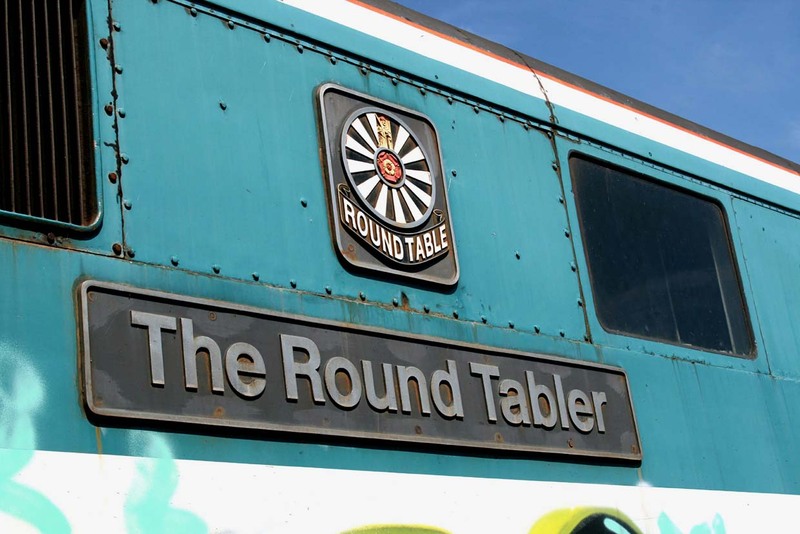 It was pictured in Westbury during a short halt for a crew change whilst working '6A77' the 11:42 from Merehead to Theale. Late model GM 66763 wa standing in Westbury about to depart for Stud Farm with the regular '6M40' from there.It was very recently named whilst attending the Diesel Gala at the Severn Valley Railway.This is now one of several GBRf locomotives now honouring various different preservation operations around the country. 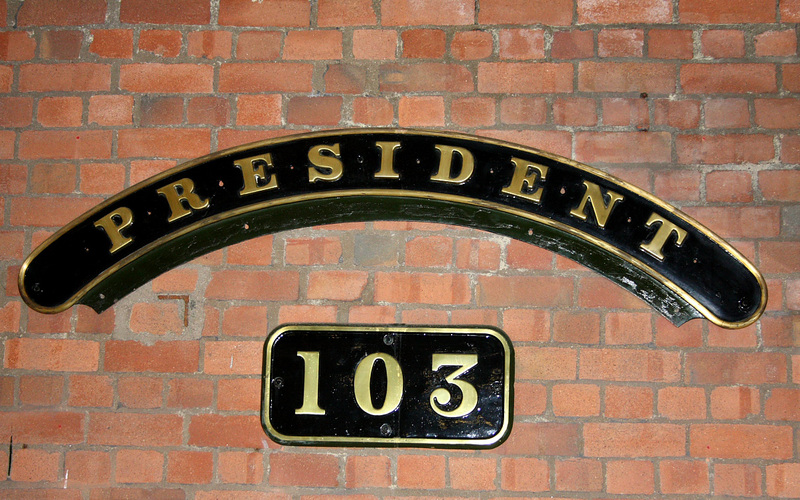 Here is the rather large cast-brass nameplate affixed to 46100 'Royal Scot'.It describes its adventures in the USA & Canada in 1933.Amazingly now over 80 years ago! 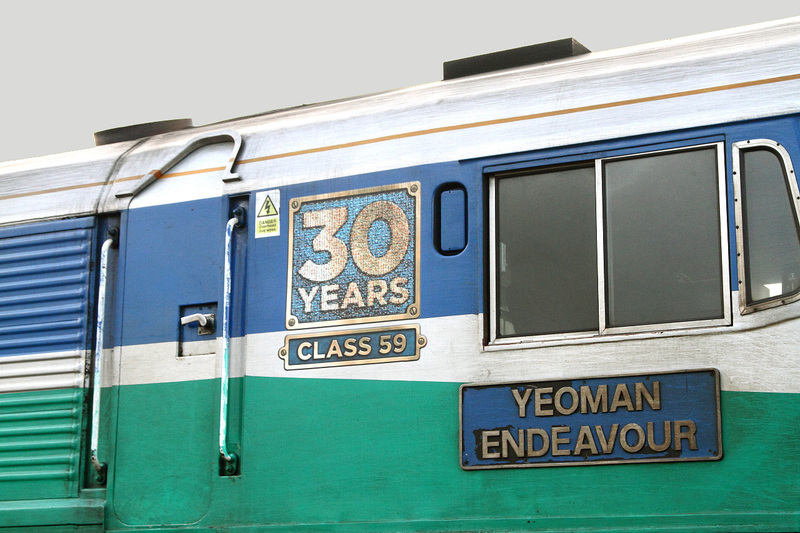 This is 66850's nameplate.Pretty self-explanatary really.He was the founder of the Charity mentioned on this cast nameplate.Pictured at Westbury Station. 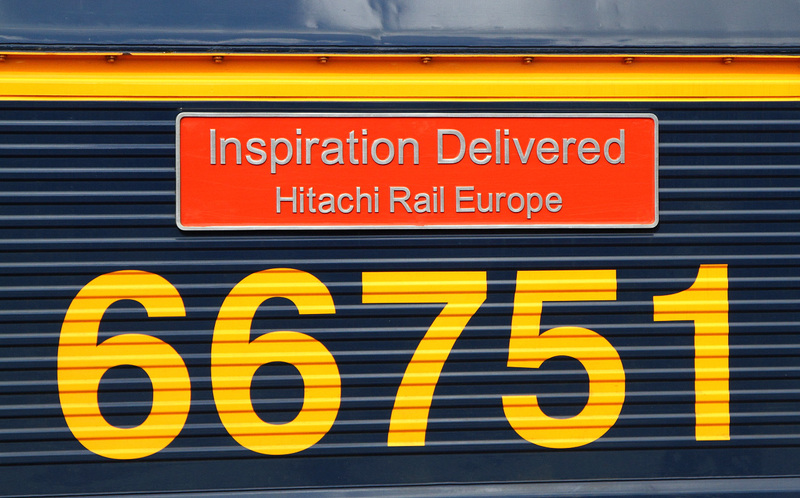 The reason for todays visit to Westbury station was to picture this locomotive 66751 which had come up from Eastleigh to power '6M40' to Stud Farm.Unfortunately the sun failed to shine at the right moment so the best I could manage today was a shot of the ex-Rush Rail European Loco's nameplate which marks this loco's involvement in moving the latest IEP-Crap around in the Midlands on trails-etc.No doubt in the near future it will resume those duties so will again be lost to this area.I managed a shot of its partner 66750 in the original Blue last year but not this on.Click ​HERE to see. Hopes of a nice shot of Pioneer-59001 on '7C77' the 12:39 from Acton to Merehead at Masters-Crossing nr Fairwood-Junc carrying its new commemorative '30 Years' plaque's was completely dashed by the fact it was running 30 minutes late and by then it had gone completely dull-n-dark! 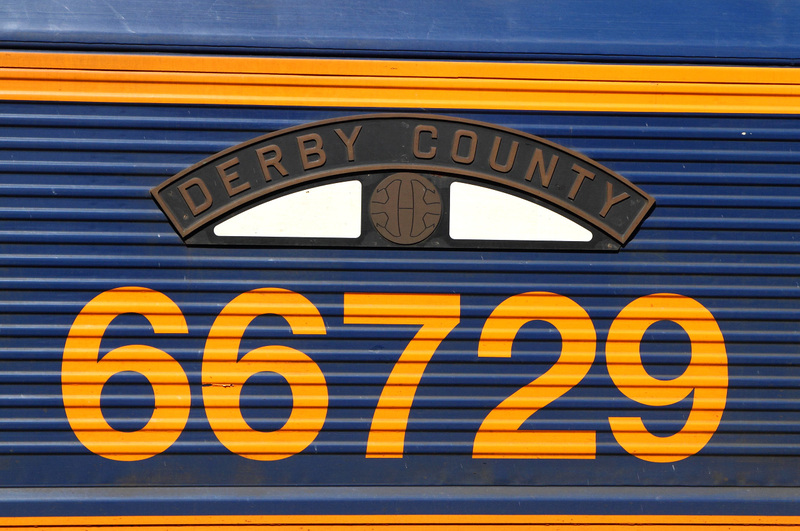 So 'Plan-B' was to just grab a shot of the new plates/decals as it sped by at about 50mph.Use of 1600-iso and a bit of panning obtained the shot you see here..Better than nowt--Just! Here is a close up of the inscription added to 43172 along with the nameplate honouring Harry Patch.It is a section of a famous text from the 'For the Fallen' poem by Laurence Binyon. 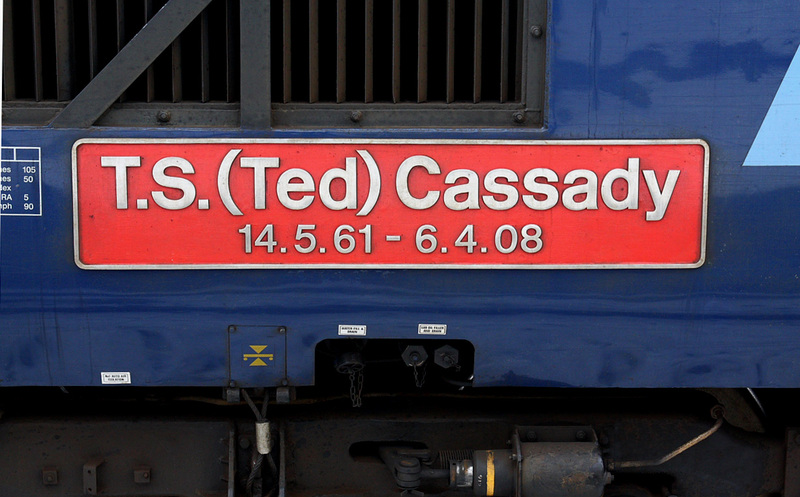 One of FGW/GWR's more thoughtful attempts at naming a Class-43. 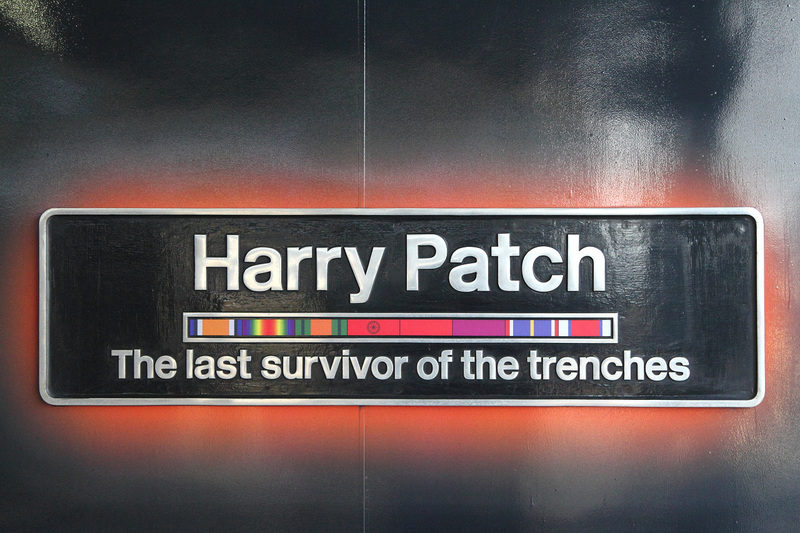 This is the cast aluminium nameplate affixed to 43172 to honour the longest lived but now deceased Harry Patch.He was the final living soldier from the trenches in WW1.The plate includes a representation of his army service medal ribbons. 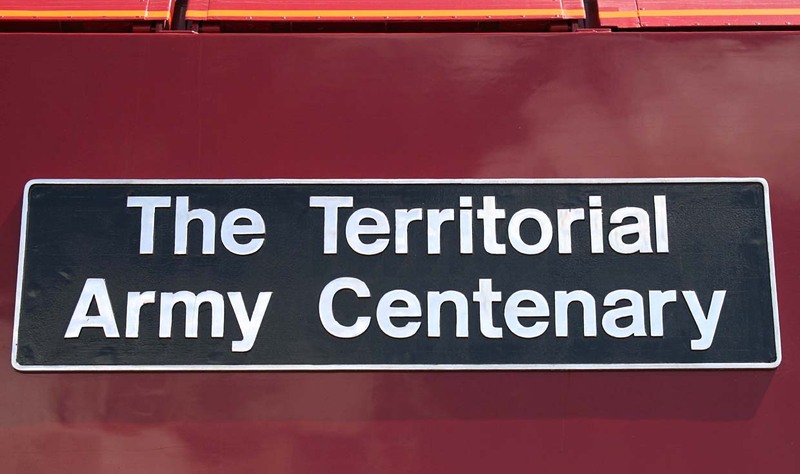 ​To read more about this man who did in fact live quite locally at Combe Down nr Bath and finally at Wells in Somerset. 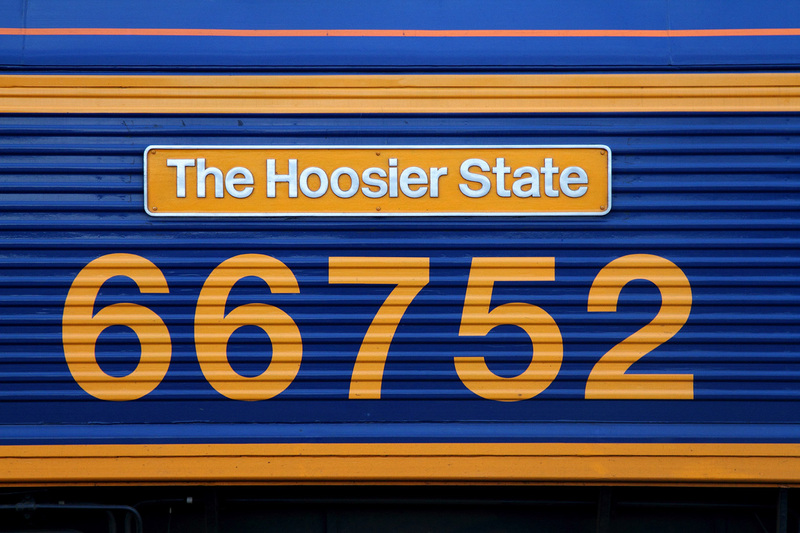 Here is the nameplate that 66752 was carrying when it was delivered into the UK from Muncie-Indiana USA at Newport Docks in July 2014.This loco was the first of the initial batch of new GM-66/7's for GBRf that were constructed at the new Caterpiller owned 'basic minimum wage' workshops recently opened there to replaced the old Plant at London-Ontario in Canada. 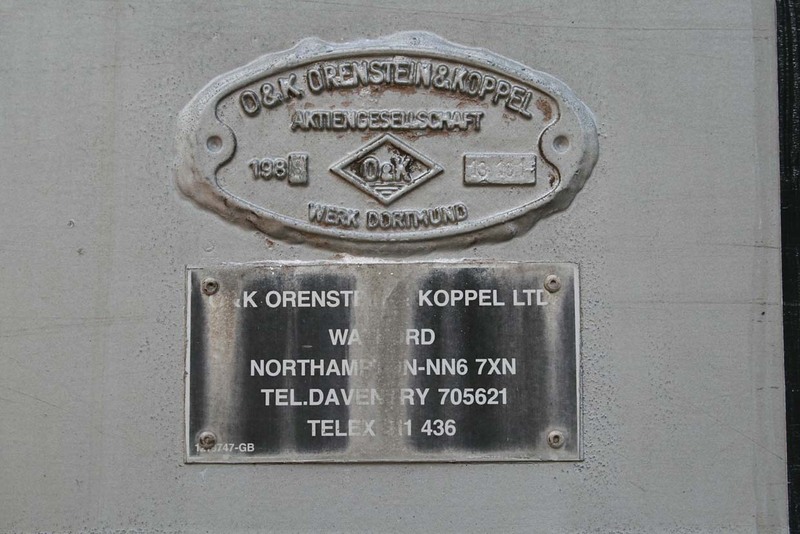 That old established Factory was closed by that company because the workforce would not accept a 50 to 60% cut in wages to retain their jobs after they had taken it over! 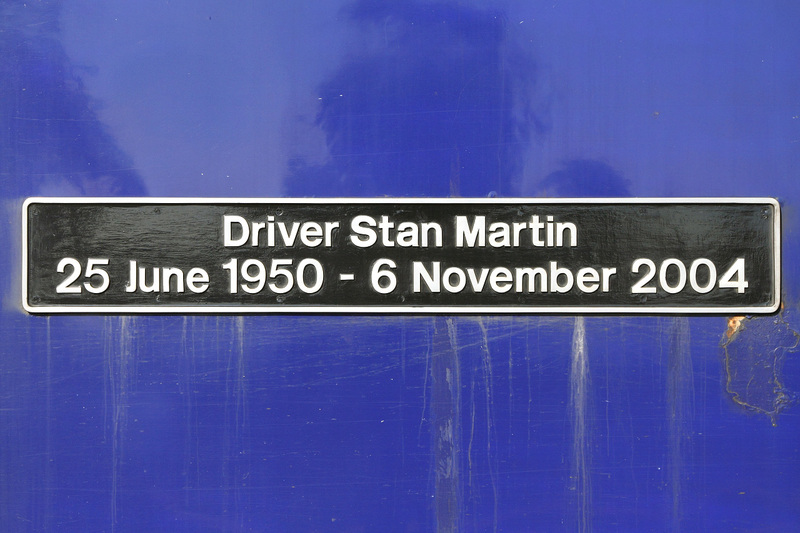 HST Power-car 43139 carries this nameplate in memorial for 'Driver Stan Martin' who was tragically killed in the Ufton Nervet Crossing accident whilst driving 43019.That particular PC never ran again and was eventually broken up whilst 43139 was given this plate on 24 june 2005 which would have been Stan Martin's 55th birthday. 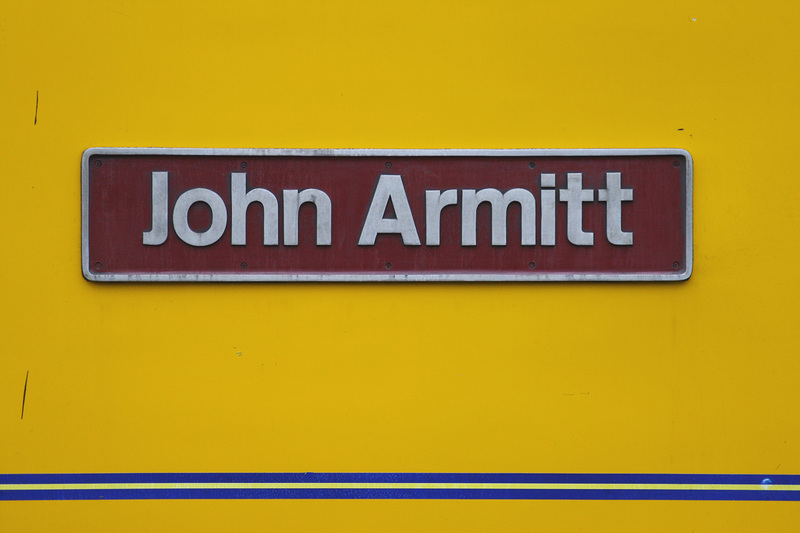 Just over 2-hours after it went to Paddington from Camartham 43126 put in another appearance at Swindon,this time going to Bristol.No mistaking this engine. 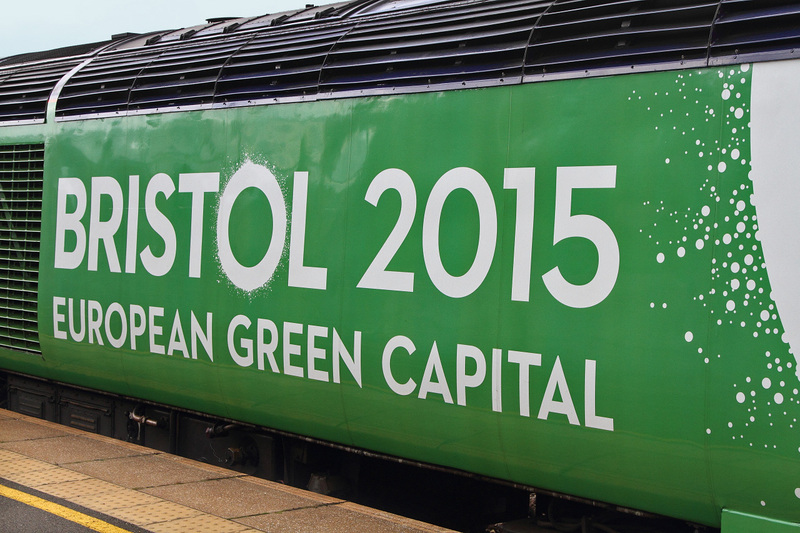 I just hope some passengers do not think this working is the 20:15 to Bristol!!!!!!!! 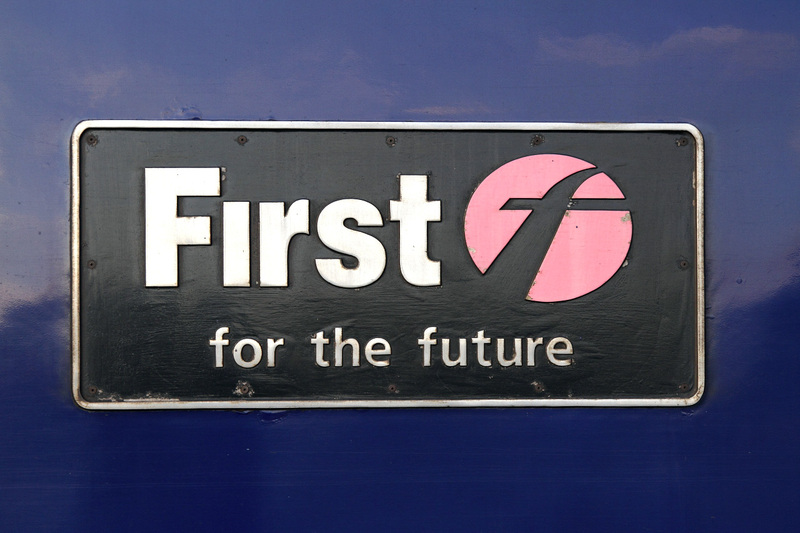 In just 5 days time on the 20/9/15 the current franchise run by First-Great Western formally ends and the replacement (Still operated by 'First') will come into being.It will be known as simply 'Great Western Railway'.Trains are to be reliveried in a very dark green/silver.Earlier today at Westbury an HST was seen with 5 out of the 8 coaches stripped of its logo's and dynamic lines livery.The changeover begins! 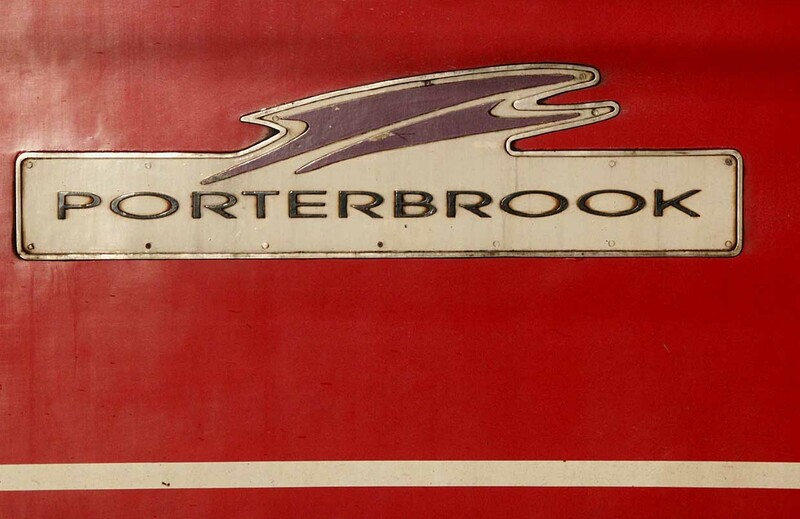 So here is a last look at the decals-etc on Mk-3 buffet coach 40743 in a westbound service from Paddington to Exeter. 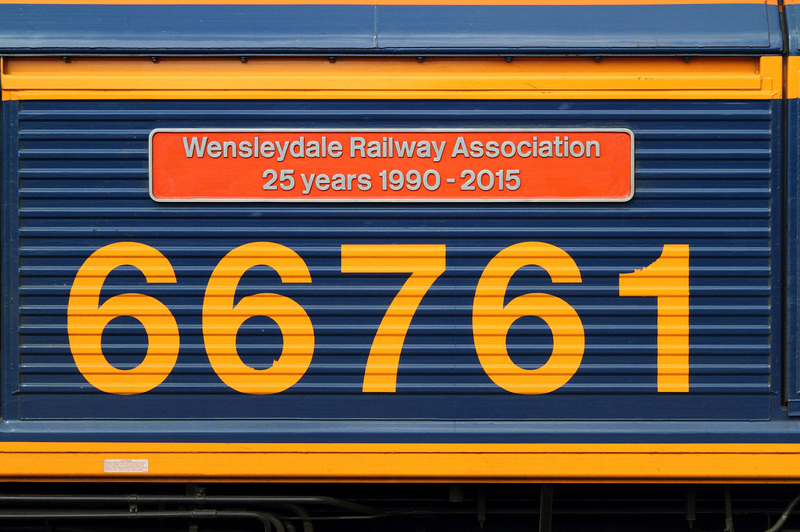 Here is a closer look at the script on the flank of 60066. 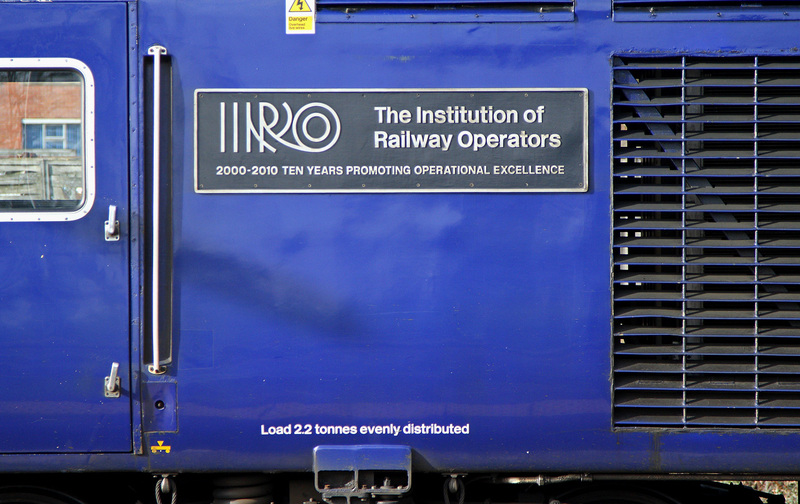 'Powering Tomorrow----Drax'.Sadly the Class-60 type is unable the haul the new 'Biomass' type wagons that DBS now use for transporting this type of fuel to Drax because of an incompatability concerning the air supply from the loco to the wagons.So ironically this engine will never actually help to 'Power Tomorrow' or any other day for that matter! 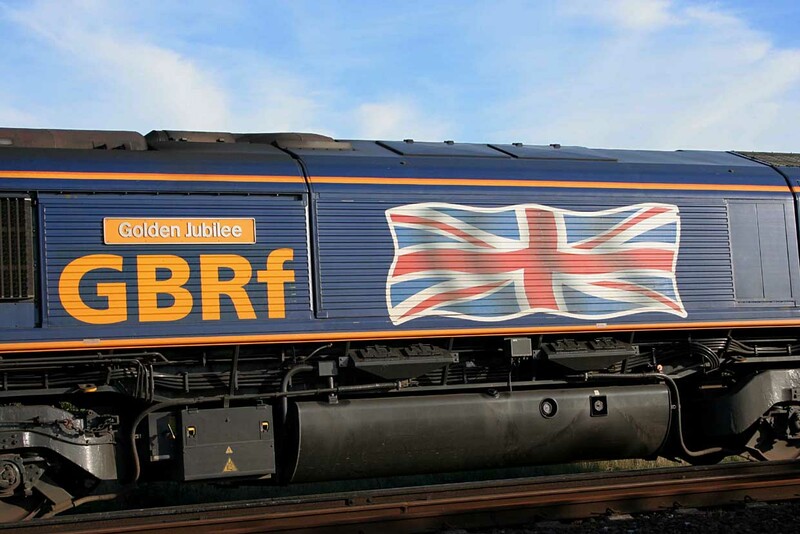 GBRf have taken to naming quite a few of their 66/7's after Football Teams in the style of the long gone LNER B2 & B17/6 4-6-0 steam locomotives.As can be seen the nameplates are a pretty good representation of the LNER-originals apart from the half-footballs now being flat probably due to gauging issues.They are even cast in brass and not cheapskate aluminium.I well remember as a 10 year old boy window-hanging the original steam engine 61651' Derby County' in the first coach from Colchester to Ipswich via Parkestone Quay way back in 1959.That was actually the year it was finally withdrawn later that summer. 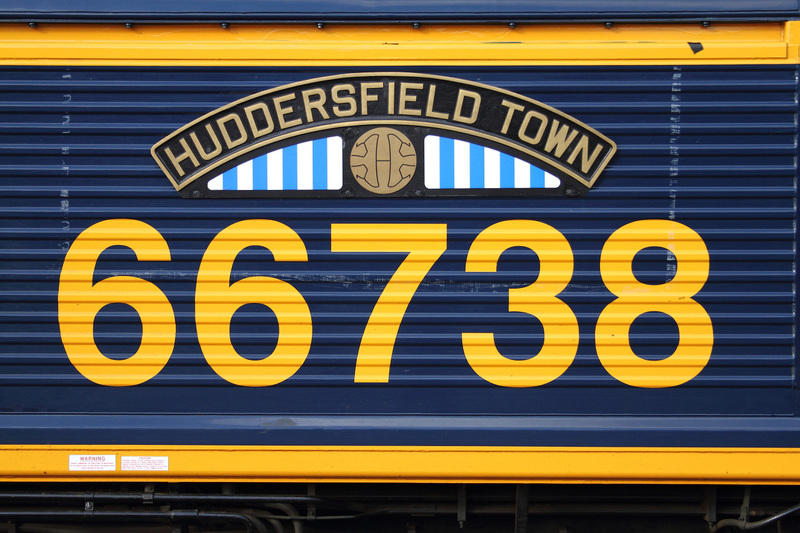 This name 'Huddersfield Town' originally graced an LNER B17/6 4-6-0 Number-2853 which became 61653 upon nationalization until it was withdrawn for scrap in Jan/1960.GBRf have done a superb job in resurrecting some of these old 'Football Club' names particularly as the plates themselves are cast in brass and are a fair replica of the originals.Unfortunately the 1/2 football below the names themselves had to be modified to just a flat representation almost certainly due to gauging issues! 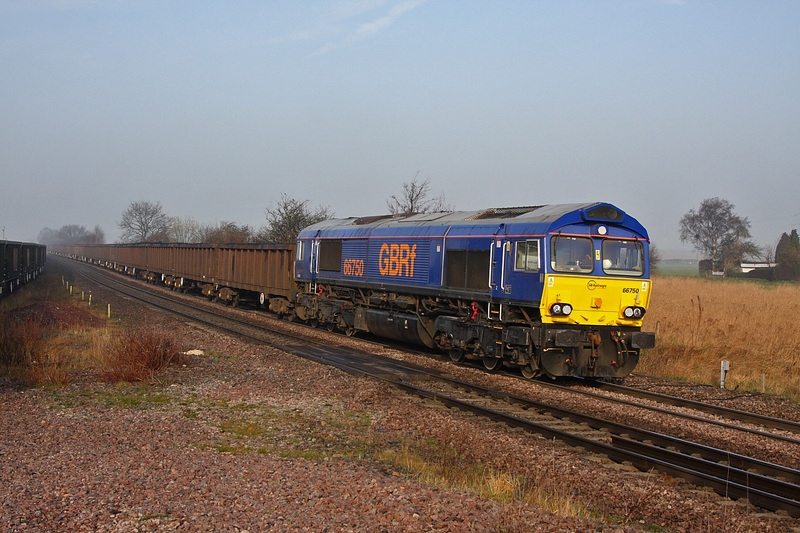 Loco GBRF 66738 was in Westbury for this study. 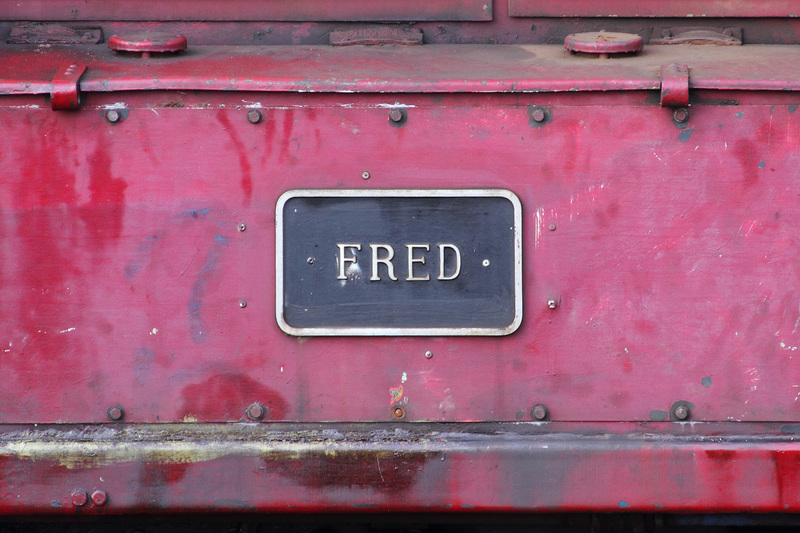 The current Westbury '08' shunter is 08799 which carries a small nameplate 'FRED'.A few years ago it was named 'Andy Bower'.Note how careworn this poor old 55 year old piece of railwayania is these days.Built in Derby in 1960 as D3967. 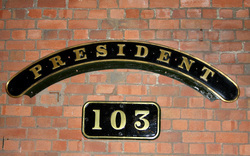 This is the nameplate carried by GWR 4-6-0 7819.The loco was one of the many Manors saved from scrap at Woodham's Yard at Barry.For certain this is a replica made for when it returned to steam way back in 1977.Altogether it completed 17 years service in steam before requiring major work to steam once again.Hence its current status here in the Swindon Outlet Designer Centre which ironically was where it was built in 1939 when the place was the GWR's Main Works. 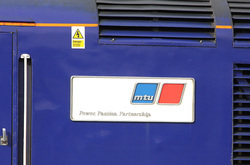 This P/C along with 43009 were of coarse the first two to receive the MTU engines experimentally.They were a complete success and the entire FGW fleet was subsequently modified. 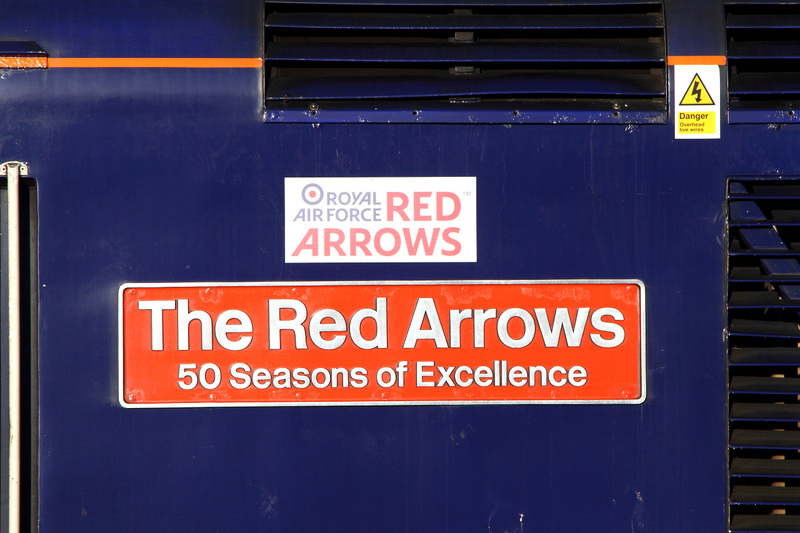 Here is the nice cast red backed nameplate now fitted to 43155 to pay tribute to the RAF- Display Team the Red Arrows.These were fitted for this years Dawlish Air Show back in August.Pictured whilst 43155 was standing in Swindon heading for Paddington with a service from Paignton. 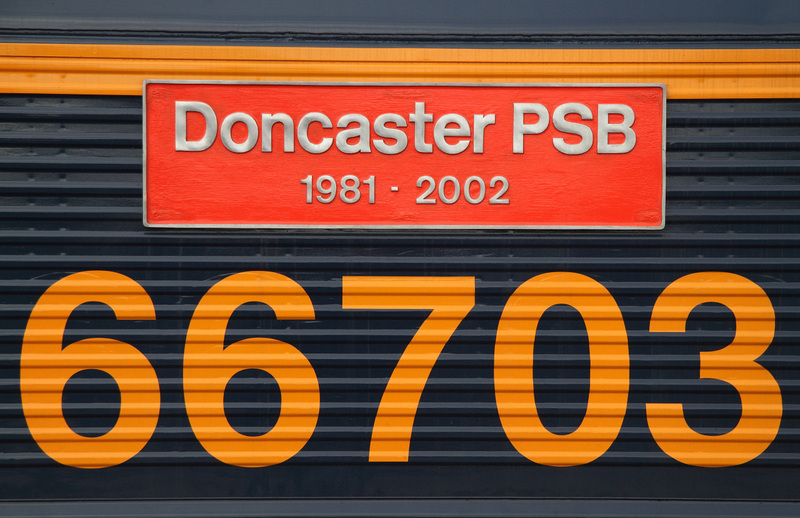 GBRf's 66703 sports a nice red-backed nameplate 'Doncaster PSD 1981-2002'.The loco has only recently lost the original style livery and gained the now virtually universal Europorte colours,very similar but differant (If you know what I mean).Recorded at Westbury just prior to it departing for Stud Farm on '6M40'. 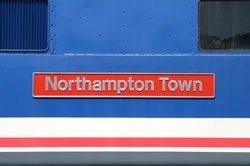 Since the NMT spends most of its time running non-stop everywhere chances of picturing the nameplates of the dedicated Power-Cars are fairly few and far between. 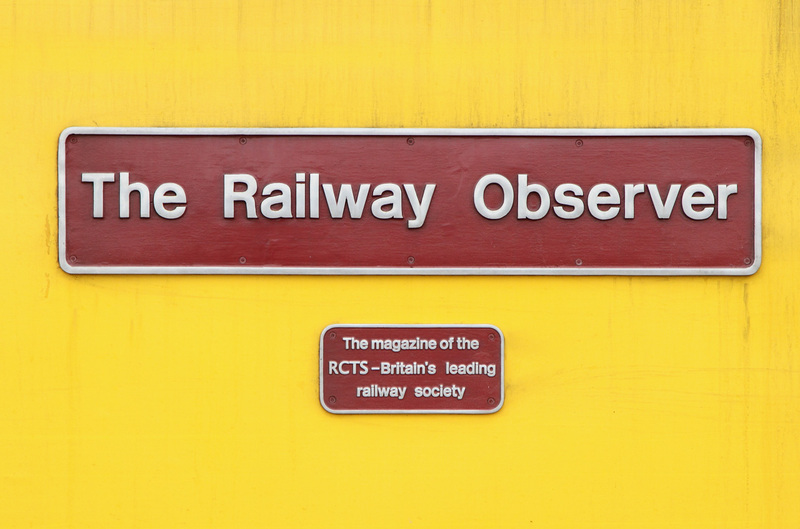 However during a 5-minute halt at Westbury whilst the crew changed ends I was able to record 43014 'The Railway Observer' c/w a small decriptive plate.Naturally being the property of NR the entire train is liveried in banana-yellow! 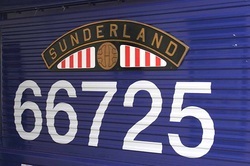 This is the flank of the freshly repainted 66722 which until recently was in 'Metronet' colours but after that venture failed spectacularly it was only a matter of time before the series of locomotives given that livery were all repainted. Who was this person? 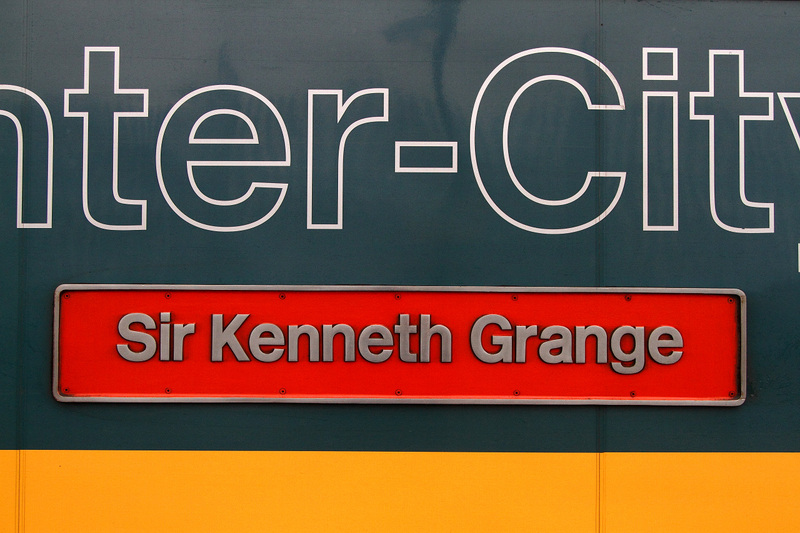 He was a leading light in the 19th century building the Metropolitan and Grand Central Railways,both of which radiated from London. 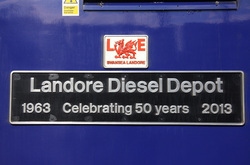 As I do not visit station platforms for my photography very often, today was a good opportunity to picture a couple of the more interesting nameplates fitted to the Class-43's in the FGW-fleet.This one on 43140 is pretty self explanatory and is finished off nicely with a nice secondary Welsh-Dragon plate as well. 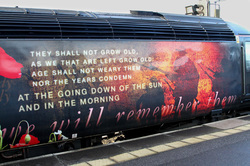 Pictured whilst stopped at Swindon Station. 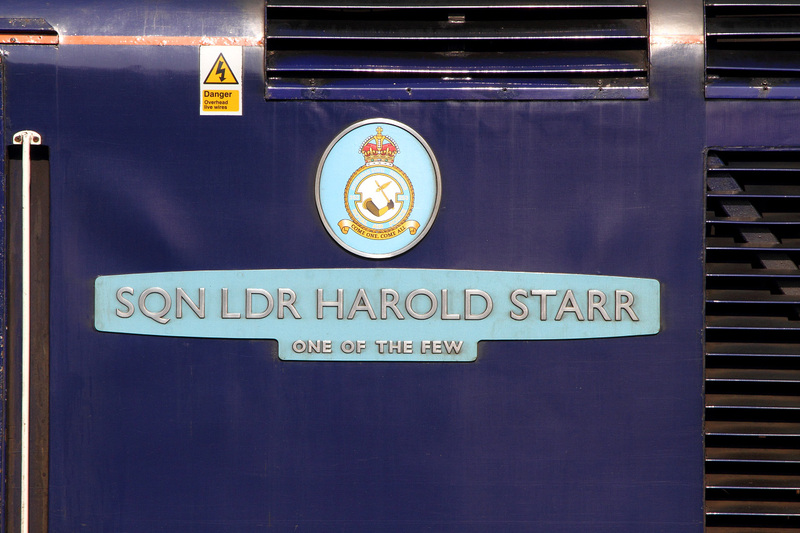 Here is the nameplate affixed to HST Power-Car 43175 to mark the 175th anniversary of the GWR.Nicely done in the original GWR style 'font'.Just a pity FGW didn't spend the extra few quid to have it cast in the more traditional brass! 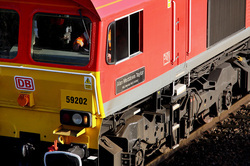 Pictured whilst halted fittingly at Swindon. 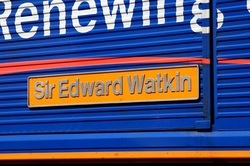 This is the big nameplate now fitted to the preserved 31271 to pay tribute to this historic locomotive depot which was finally closed and demolished in the first years of the 21st century.The huge site in East-London is now redeveloped as Stratford International Station and also as part of a Shopping Mall !!! 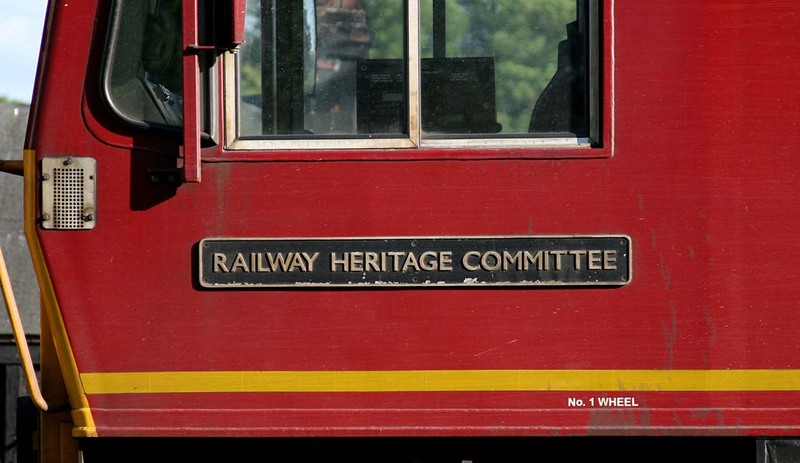 It was pictured at Medstead and Four Marks whilst the Loco was halted there picking up passengers. 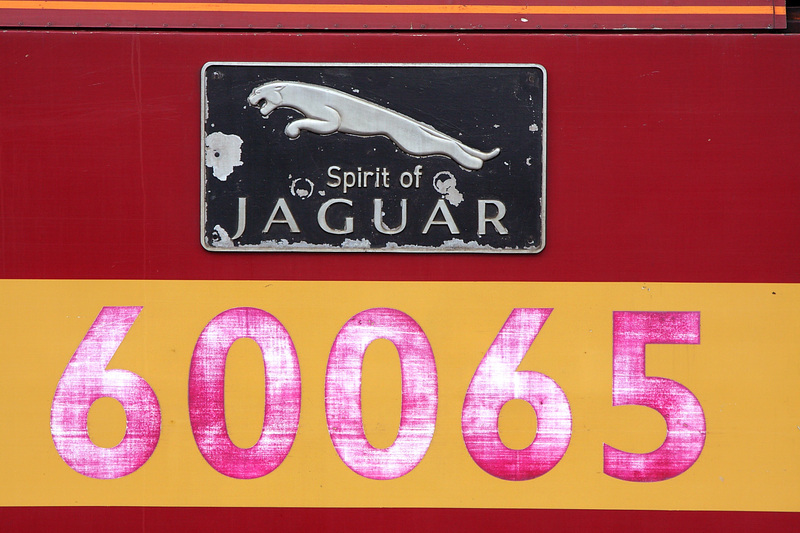 Here is the nameplate of 66619. 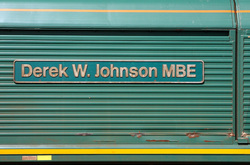 'Derek W.Johnson MBE'. 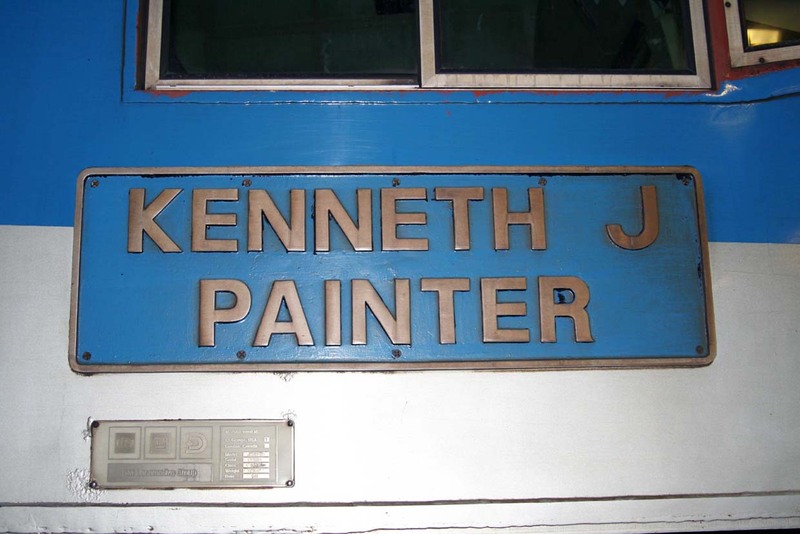 That person is the MD and co-founder of Johnson Steven Agencies Ltd which is very big in Shipping and Container transportation.This locomotive was the 100th Class-66 to be put into service way back in 1999.It was named as the result of an auction for the privelege at the 40th Freightliner anniversary dinner. 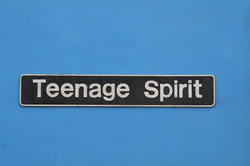 Mr Johnson obviously won the bid! 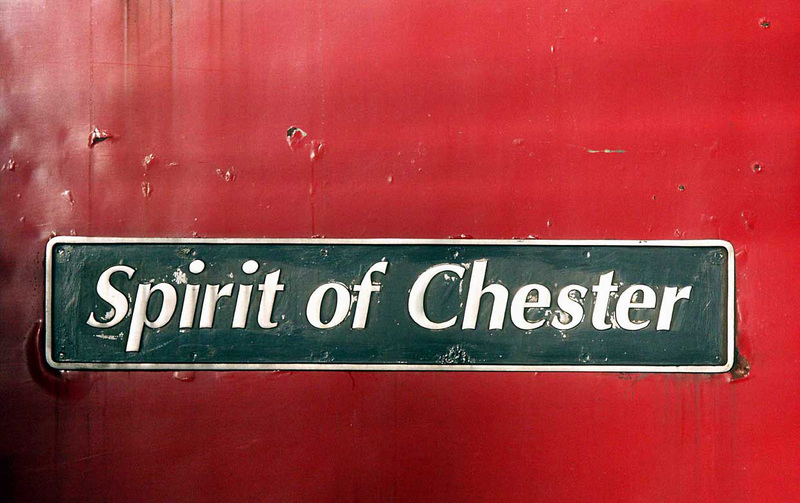 59202 was the last of the 59/2 series to get a repaint into Schenker-Red.Also, apart from 59206 which was named years ago the first one to get renamed after working for some considerable time nameless.. It's another nameplate associated with the stone traffic out of Merehead 'Alan Meddows Taylor MD.Mendip Rail Limited'. 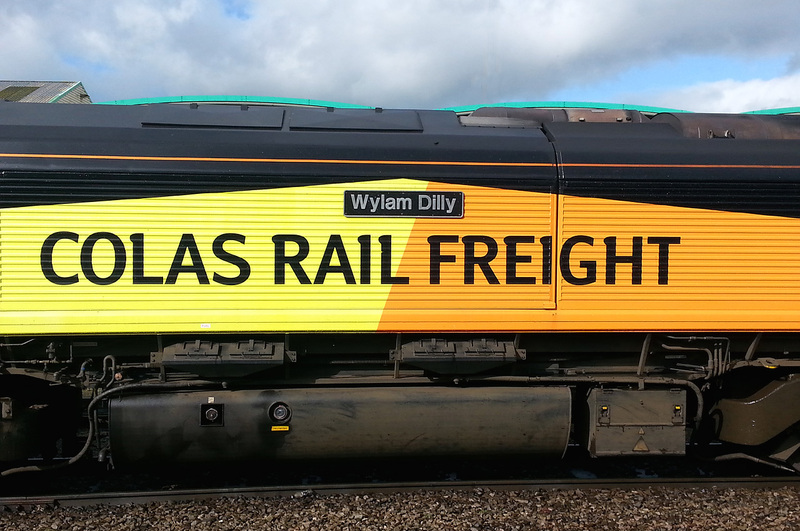 The former Freightliner 66576 now runs as 66849 operated by Colas-Rail.It carries the name 'Wylam Dilly'.This is the 2nd oldest steam engine still in existence (after Puffing Billy) having been built in 1815.After the loco was taken out of service in 1883 it was presented to the Royal Museum in Edinburgh-Scotland where it remains to this day.This probably makes it the 2nd oldest 'preserved' locomotive as well having been there 130 years! 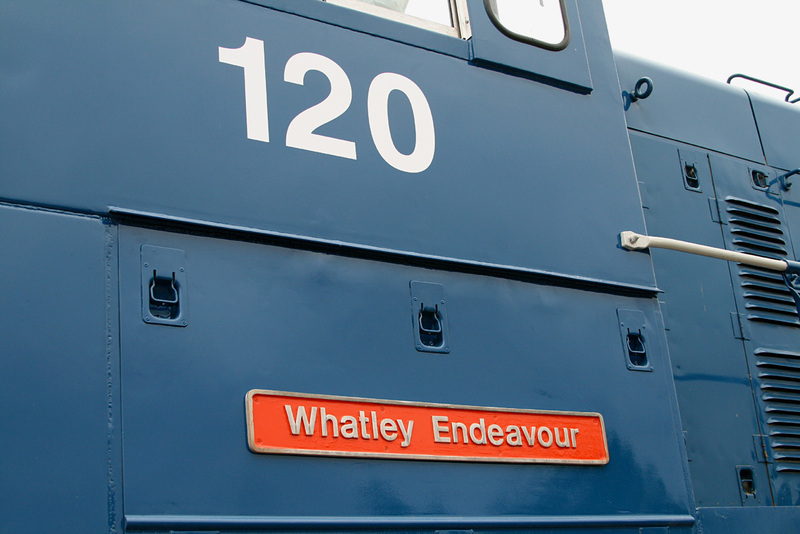 The present day 'Wylam Dilly' was parked at Westbury in between duties. 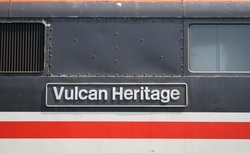 The very white nameplate affixed to 43020 to commererate the conversion of the entire fleet of HST-PowerCars to 'MTU' power units. 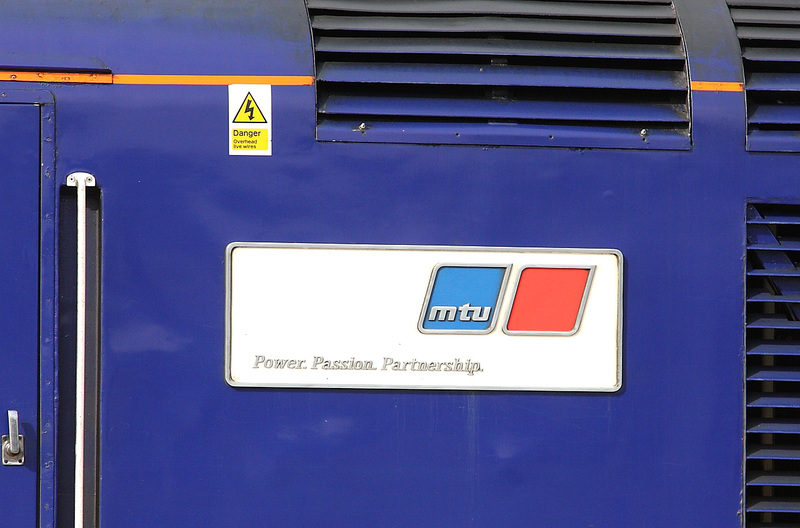 It reads 'MTU Power.Passion.Partnership.' 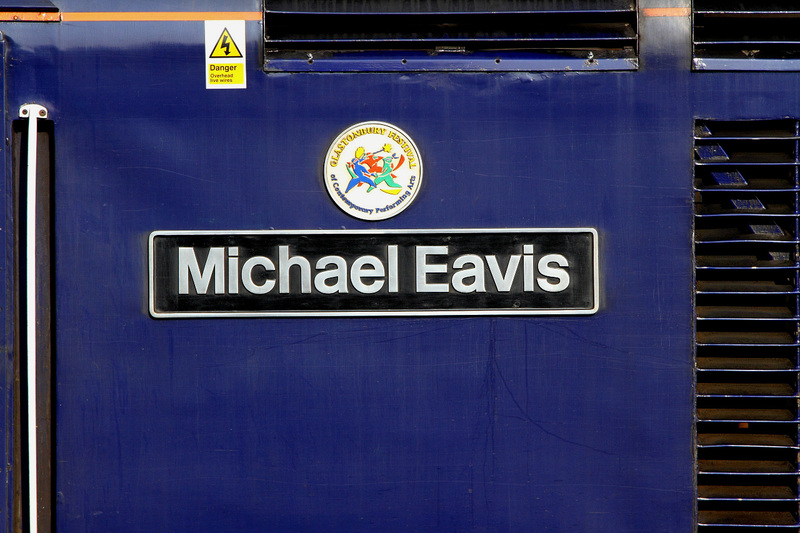 Well its got to be better than 'Top of the Pops' ????????????????????? 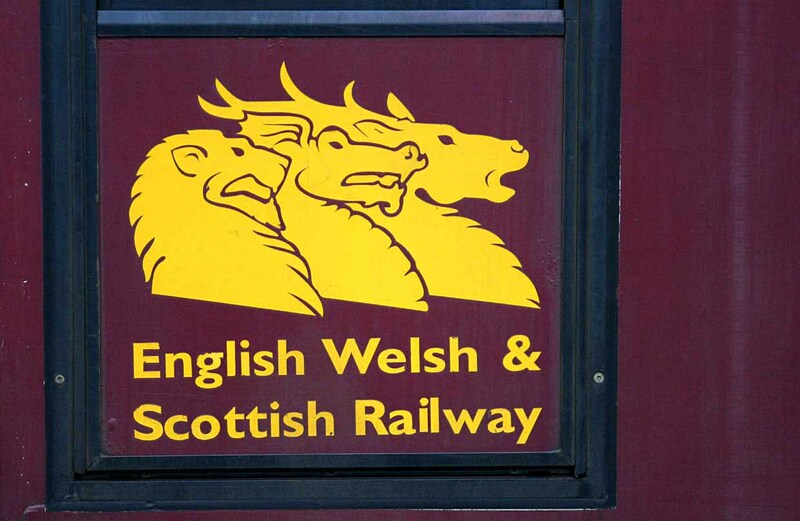 Seen at Westbury Station. 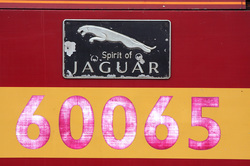 Here is a close-up of the nameplate of 60065.When this loco gets its scheduled refurbishment and repaint into Schenker-Red this distinctive plate will almost certainly not be reapplied so a shot of it here is well worth while.The loco was parked up in the 'up' yard at Westbury conveniently right next to the Station platforms at the time. 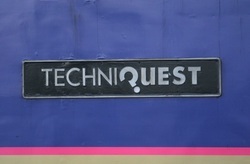 Probably one of the largest cast nameplates affixed to a member of the FGW HST-fleet. 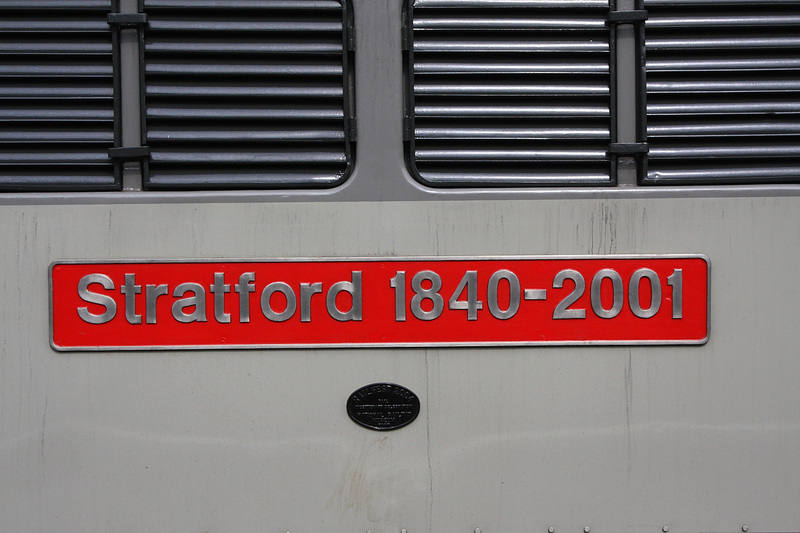 43025 pictured at Westbury during a passenger pick up there. Plate in the same style as the mainline 59/1's,'Whatley Endeavour' number 120 is the Whatley Quarry Bo-Bo switcher.Seen here on the back of a low-loader at Nunney-Catch Cafe whilst returning from Eastleigh where it was rebuilt following the serious accident at the Quarry in 2008. 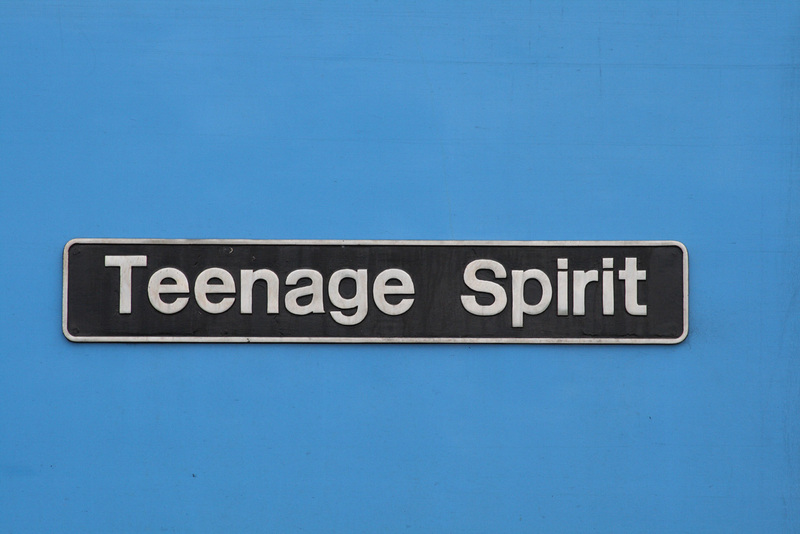 Celebrity re-paint 60074 'Teenage Spirit' named in honour of the Teenage cancer trust. 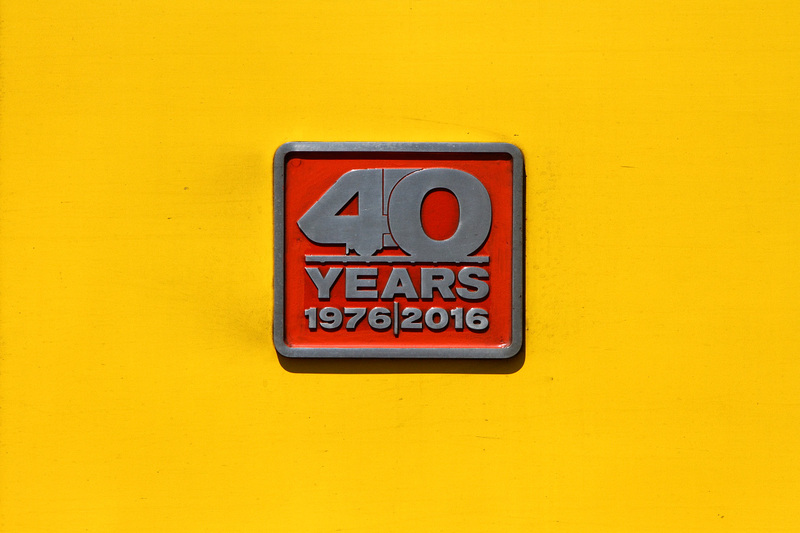 Seen at Westerleigh Oil-Terminal. 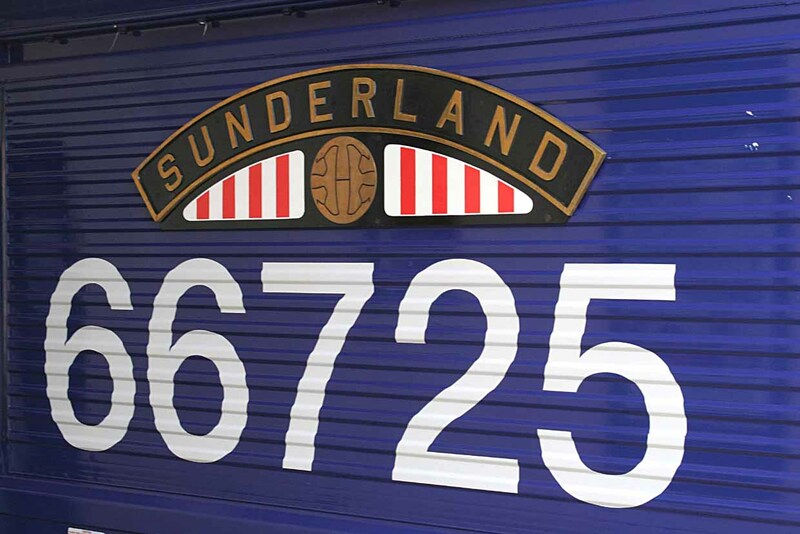 GbRf 66725 carries the name 'Sunderland' after the football team of that name.The nameplate is a fair replica of one carried by an LNER 4-6-0 B17 number-2854 later 61654 up to its scrapping in 1959.Unfortunately the football below the name is not 1/2 a ball as per original style due to gauging issues. 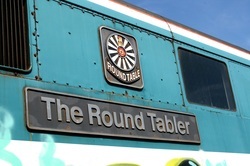 Seen at Okehampton Station during an event there. 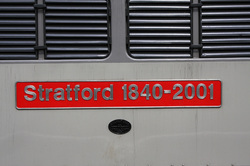 Even after over 5 years since the end of Virgin LCHS services some coaches still carried the Logo.No longer leased to Virgin of coarse. 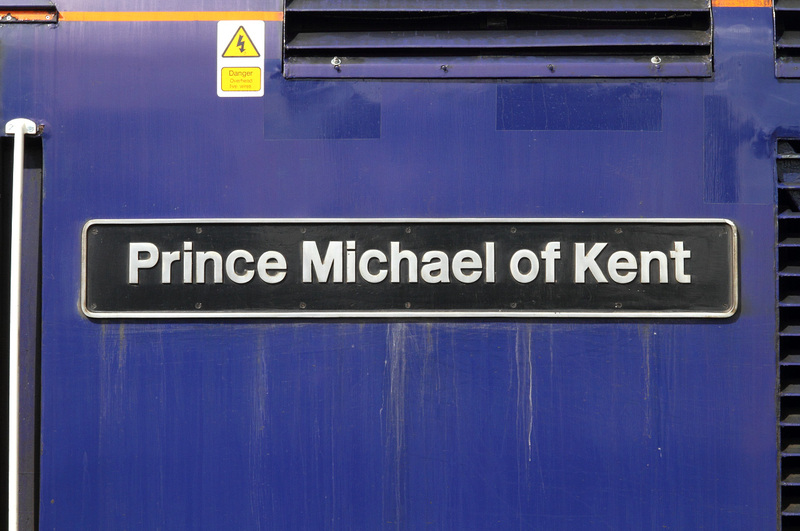 Here is Mk-2 coach 5937 being used on shuttle-relief workings for FGW standing at Chippenham between trips to Bristol. 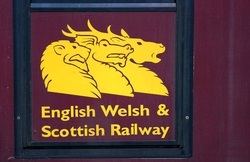 The Insignia of EW&S Railway Company as seen on 67027.Company now sold on to DB Schenker so these logo's will become increasingly rare as the years roll by. 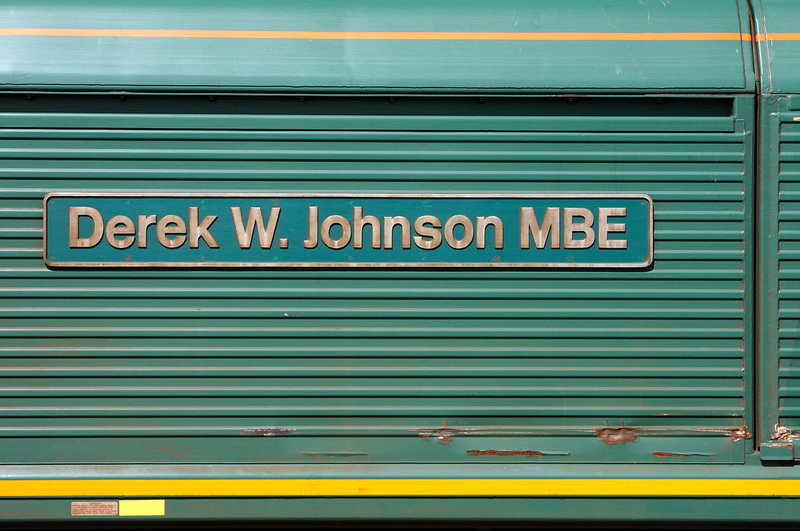 GWR owned but De-Glehn designed 4-4-2 imported from France for comparison trails against Swindon built products in the early 1900's. 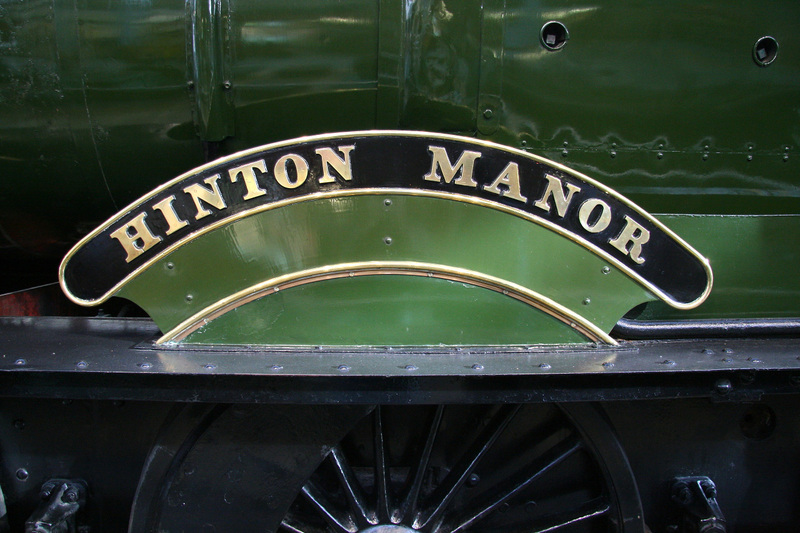 Nameplate/Numberplate now at 'Steam',the Museum at Swindon on the site of the old works there. 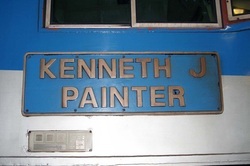 Here is an example of what can only be described as an 'Econony' Nameplate.Basically just a strip of 'Sticky-Back Fablon' available from all good Hardware-Stores (And bad ones). 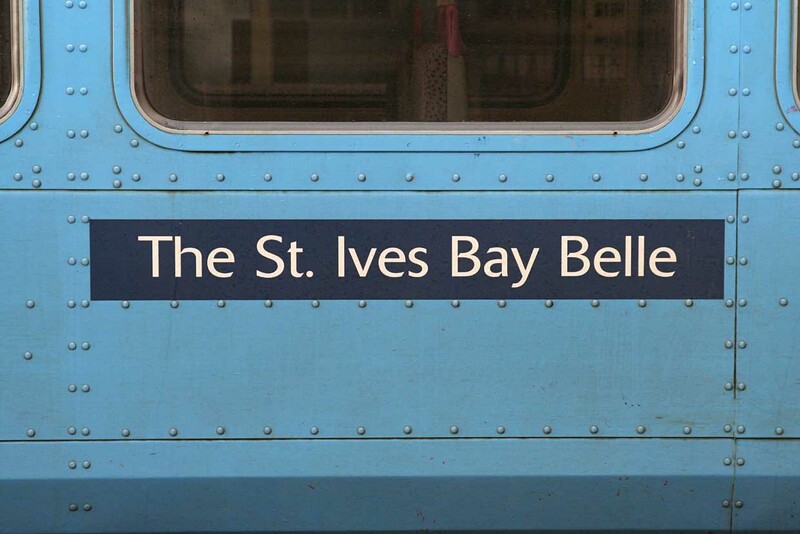 This Bug-Unit/Runaway Coach/Bucket 153329 or what ever you want to call it was named for dedicated use on the St-Ives Branch in Cornwall but sometimes it escaped! 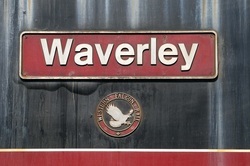 Seen here at Westbury. 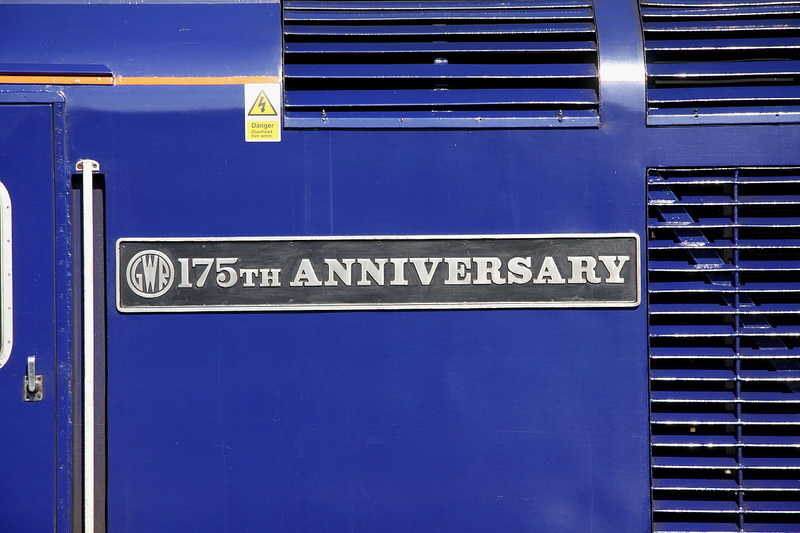 Sticker now gone along with the nice blue paint job. 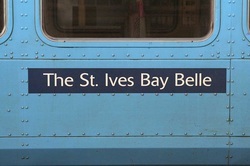 All '153-s' now wear standard FGW-Blue in this area. 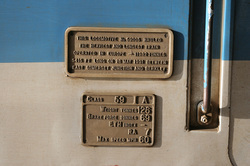 'JYA' bogie-box wagon Works-Plate showing manufacture date of 1989,number 13131.Built by Orestein&Koppel in Werk-Dortmund.Interestingly though the plate appears to be designed to be bolted on,it is completely welded to the chassis.This will certainly stop some light-fingered goog from trying to nick it! 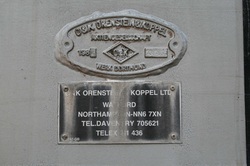 Photographed in the yard at Torre-Works Merehead. 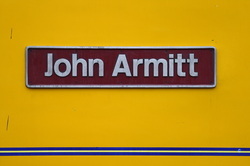 'John Armitt' a former Chief Executive of Network-Rail somehow wangled it to get one of the NMT Power-cars '43062' named after him.Uniquely (at that time) the only one of the NR fleet to carry a name. 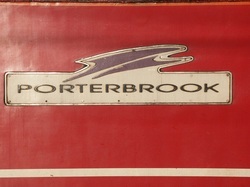 Nameplate still current september 2011. 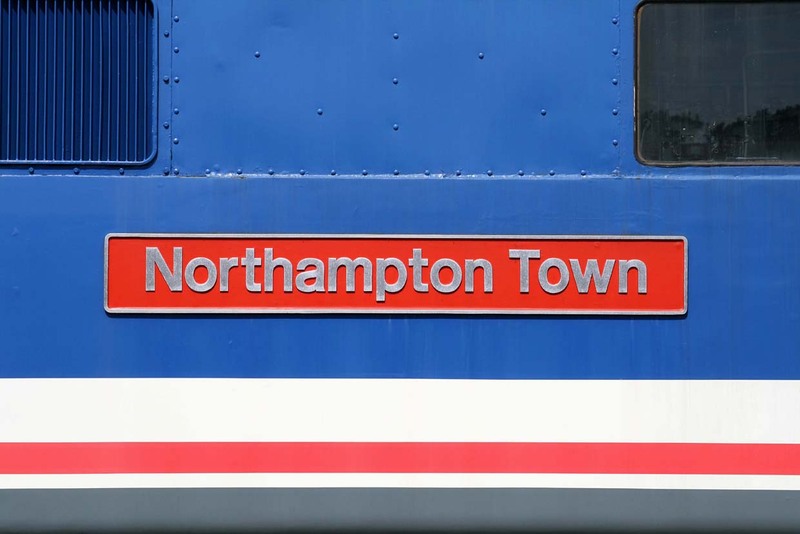 86401 was originally E3199 then became 86001 then 86401.The only '86' to ever carry NSE colours.Originally named 'Northampton Town' in 1989 up to 1997.It then became 'Hertfordshire Rail Tours' from 1998 to 2003.After being bought for preservation its first name was re-instated and it carries it to this day. 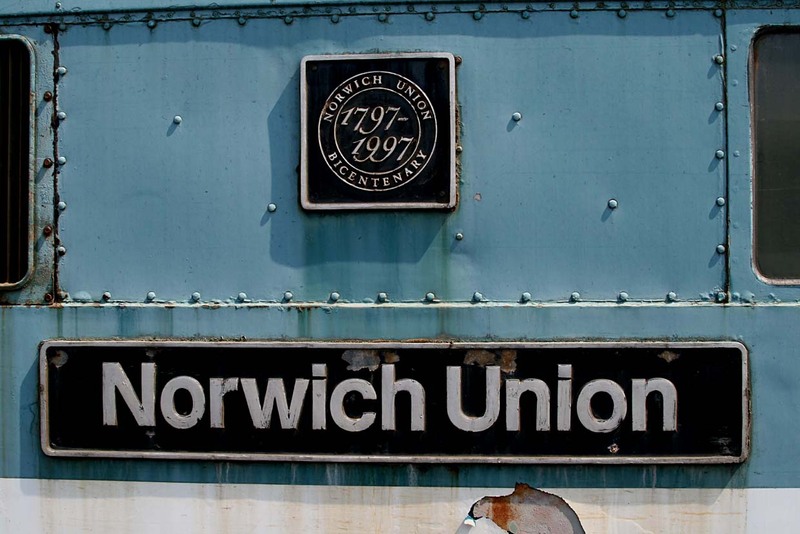 86228 was stored at Long-Marston in October 2003.Amazingly it retained its original nameplates until September 2010 by which time they had been removed.Somebody must have realised they were collectively worth nearly as much as the actual Engine! 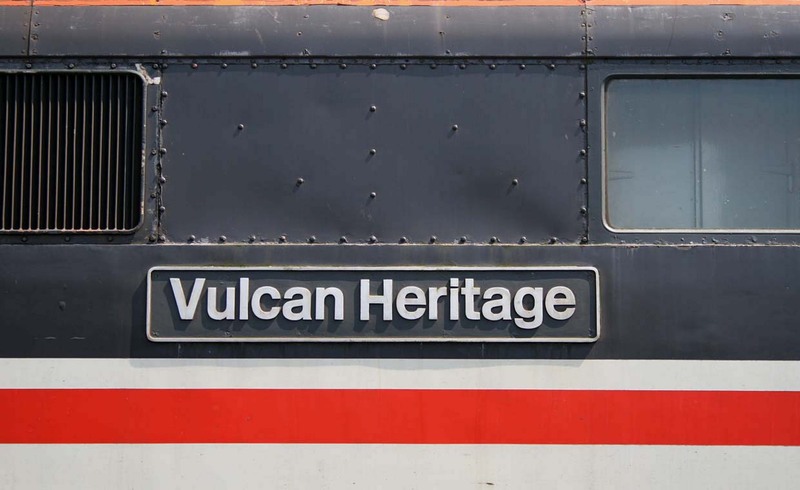 Originally numbered as E3167 and first named in 1980 as 'Vulcan Heritage' this was probably the smartest stored Loco at the storage facility at that time.Loco still in store to this day (september 2011) so just might make at return either in the UK or abroad. 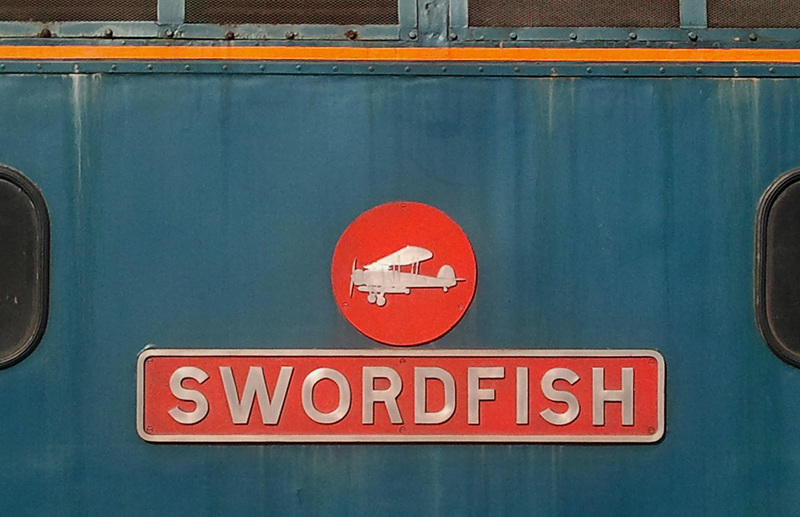 Viewed at Swanage Station,preserved and fully operational 33103.The name 'Swordfish' was applied whilst loco was owned by Fragonset-Railways and was named without ceremony in November 2002. 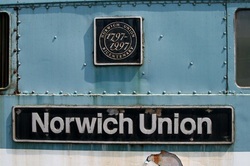 86223 still carried its name 'Norwich Union'' and assoc Crest for at least 4 years whilst languishing here at Long- Marston.Originally E3158 carrying the name 'Hector' it was finally withdrawn in april 2004.Nameplates are certainly removed now as the engine was scrapped in april 2011 at EMR Kingsbury. 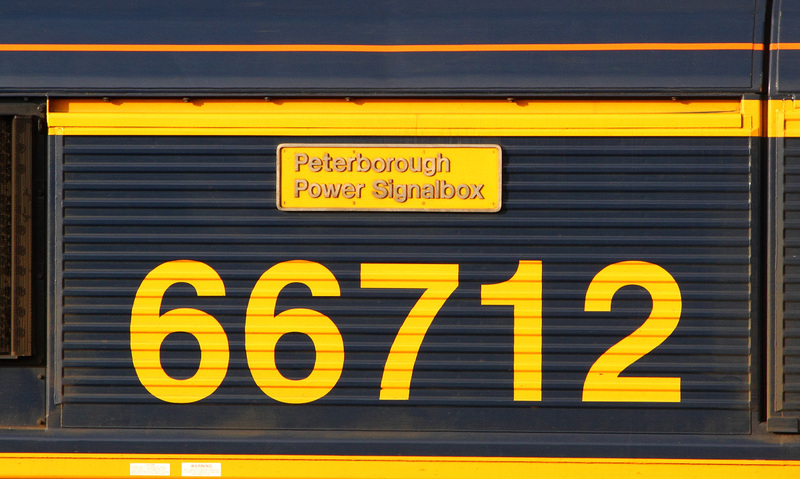 86215 the former E3165 was originally named 'Joseph Chamberlain' from 1981 to 1996 during its career on the WCML.The name now carried 'The Round Tabler' was bestowed on to this engine during its time working out of Liverpool-Street up to Norwich.Loco was withdrawn in October 2004 and 4 years later still retained its nameplates whilst stored at Long Marston awaiting possible re-use. 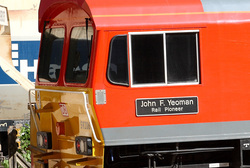 Engine still there in 2011 but do not know if the plates are still affixed. 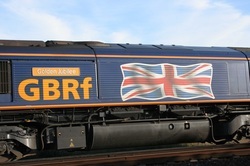 GbRf who own 73209 run quite a few of these versatile 'Jb' eletro diesels several of which carry female names.They are believed to named after girls from the main offices of the company! 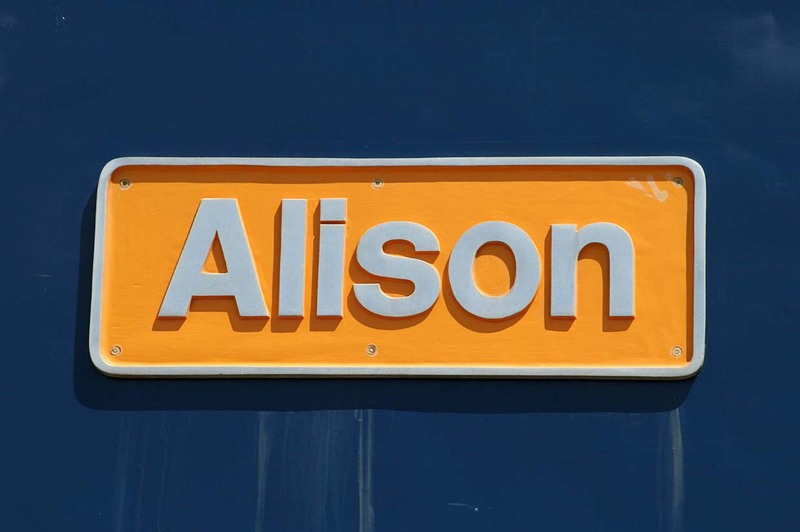 This particular one 'Alison' is now at Brush in Loughborough for some major work and quite possibly will emerge either nameless or with some other name. 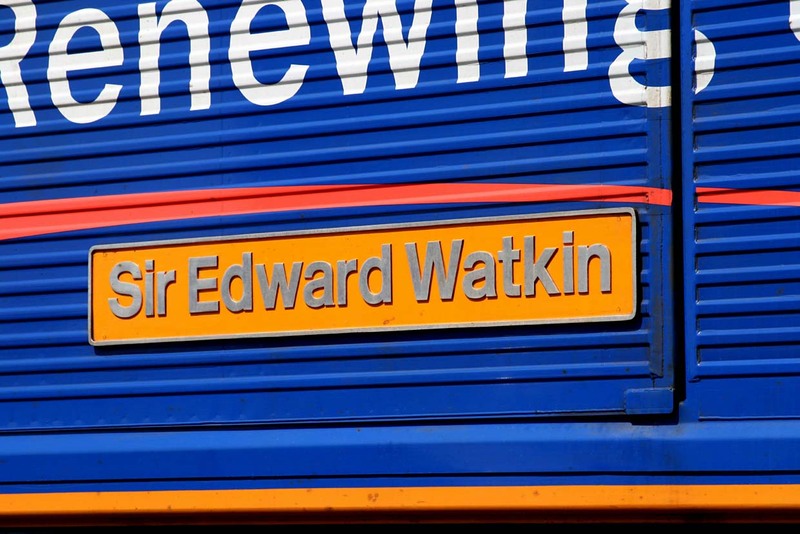 66722 named 'Sir Edward Watkin' after an amazing man that was instrumental in getting the 'Great Central Railway' constructed in the 1890's.Engine was in 'Metronet' colours at that time as part of GbRf's involvement in the London-Underground refurbishment fiasco! 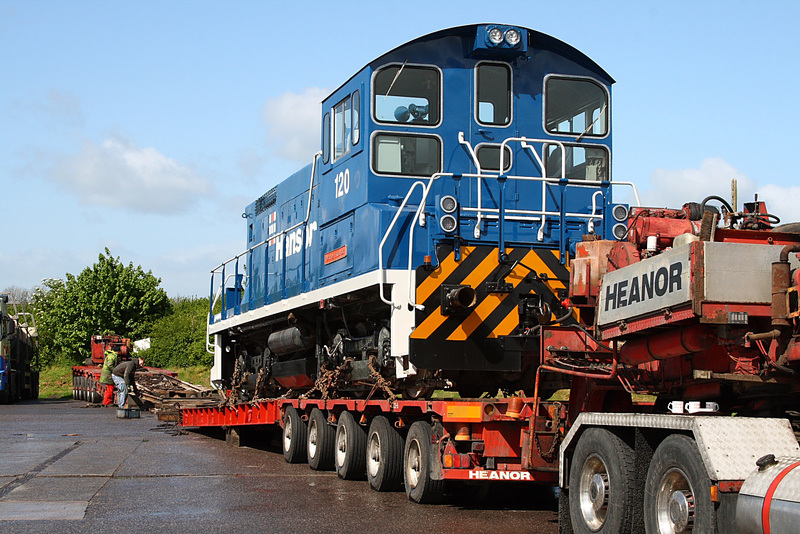 Loco was on display at a Long-Marston Open-Day. 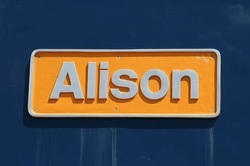 Nameplate still current in september 2011. 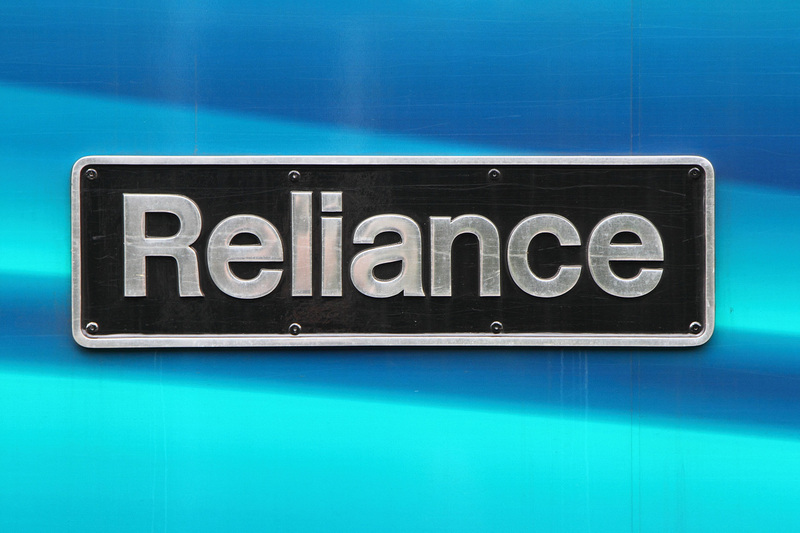 Of the 250 GM-Sheds introduced about 10 years ago with EW&S very few carry names.Those that do carry rather small ones are affixed to the cabside's on diagonally opposite corners.Here is 66200 with is 'small' nameplate. 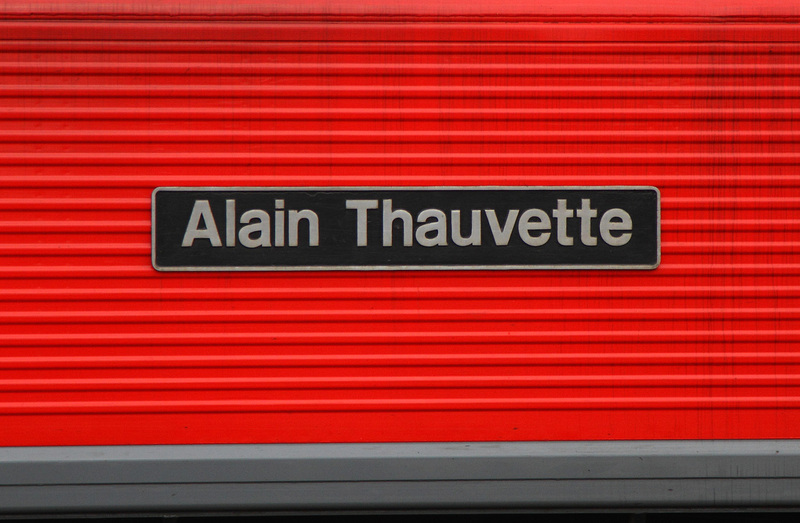 Nameplate still current in august 2011. 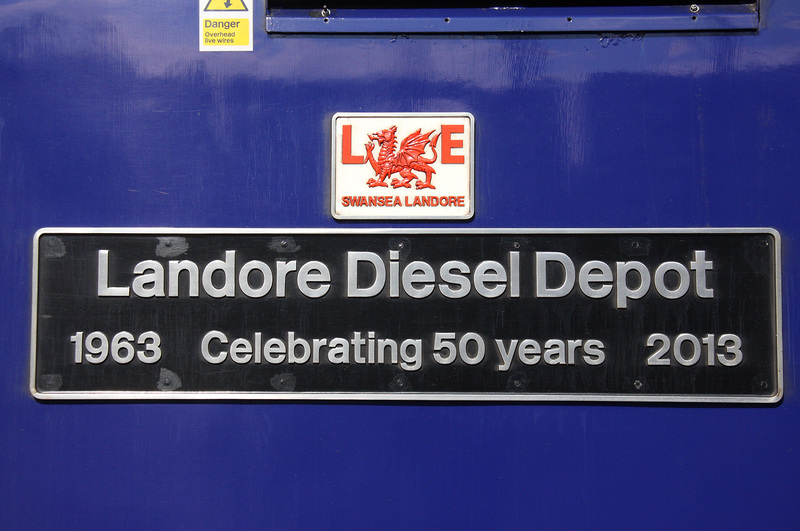 59005.This Loco has carried this name since seven days after its introduction to service in 16th-June-1989.Named at an open-day held at the then Foster-Yeoman owned Quarry at Merehead on the 25th of June 1989. 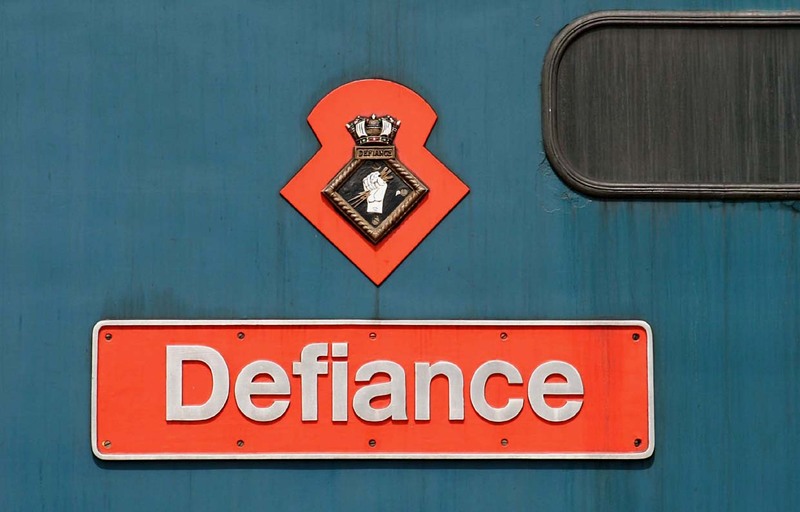 50049, a Class-50 that is mainline registered.Named after a Royal Navy Warship.Well actually take your pick from many ships and even shore bases! 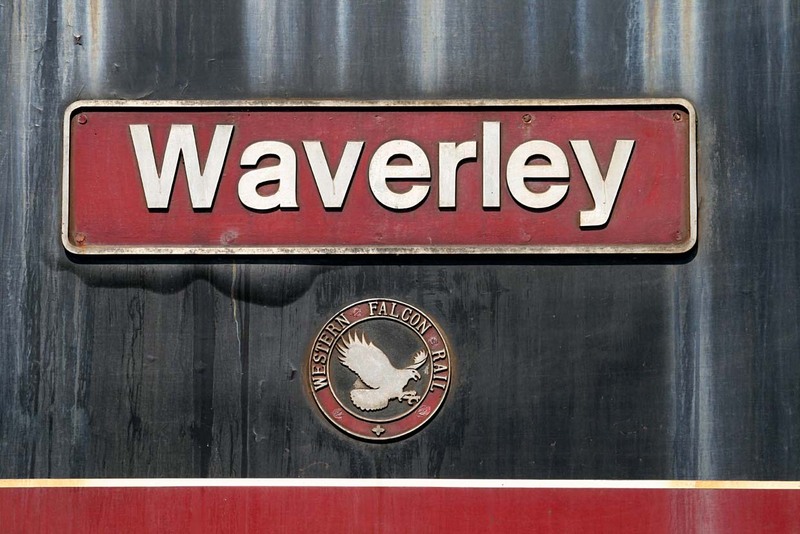 47701,the first of the Scottish 'Shove-Duffs',originally named 'Saint Andrew' then became 'Old Oak Commom Traction&Rolling Stock Depot' whilst serving for NSE.Now named 'Waverley' by its private owner but not at this time an operational engine.Located at Toddington on the G&W-Rly. 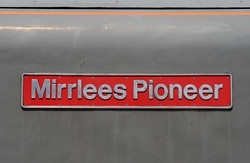 37901 named as 'Mirrlees Pioneer' after fitment of a replacement engine of that type instead of the original EE design.Hence renumbering in the 37/9 series. 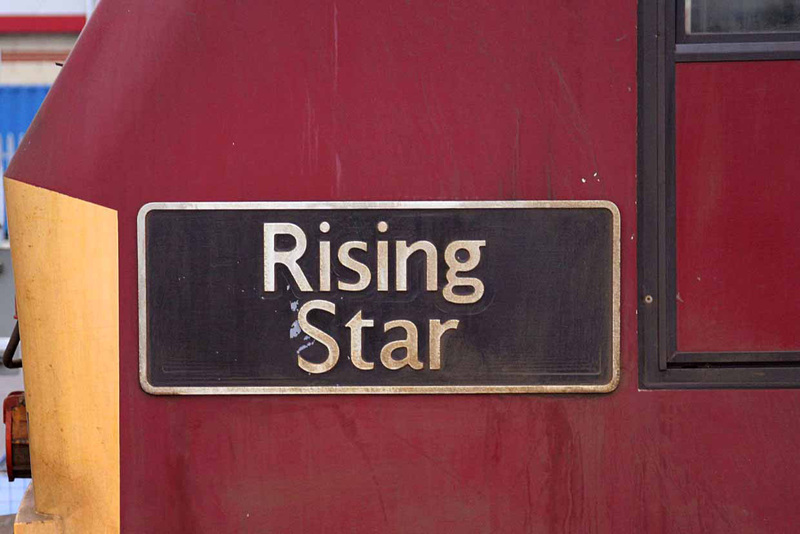 'Rising Star',a name that once adorned Britannia-Class number 70027.So it's no accident that this name is now on 67027.Pictured whilst standing in the platform at Chippenham whilst doing shuttles for FGW to Bristol and back during engineering works further east. 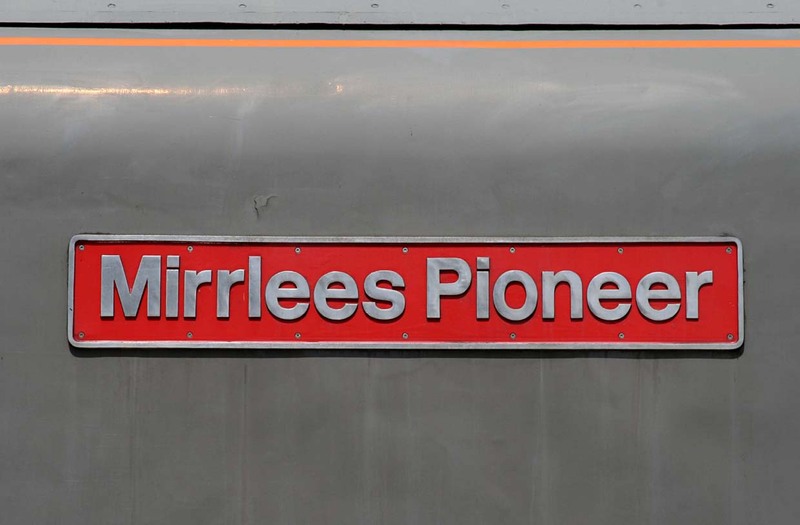 All very self explanatory.What it doesn't mention is due to the extreme weight of the train a coupling fractured at Berkley-Marsh leaving the train split in two with failed air-brakes.Hence the obscure end location for this historically long and heavy experimental working! 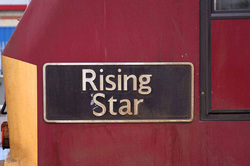 Picture taken of these commerative plaques affixed to 59005 whilst it was sat in the platform at Westbury having a crew change. 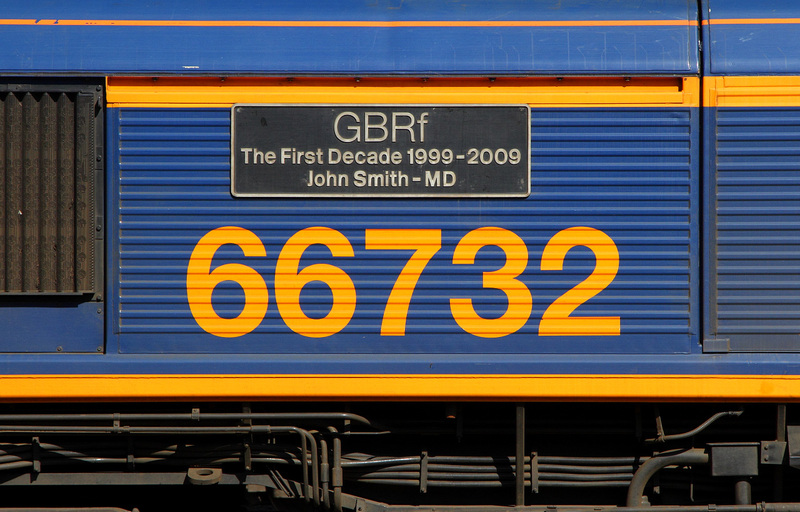 66705 officially named as 'Golden Jubilee' but universally known as 'The Flag' for obvious reasons. 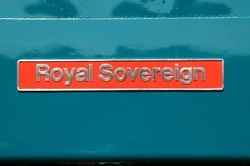 Naming was to mark the 50th anniversary of the Queen’s accession to the Throne. Seen near Petersfield in Hampshire. 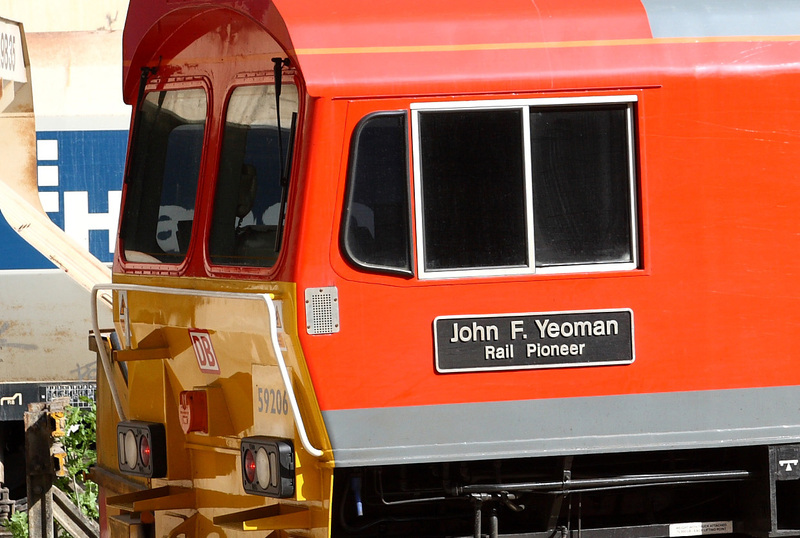 59206 was once named 'Pride of Ferrybridge' but upon becoming the first loco to wear the new DB-Schenker Colours became 'John F. Yeoman Rail Pioneer'.Loco largely used in hauling stone away from the Mendip-Quarries so a very apt naming. 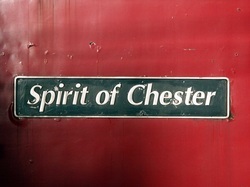 'Spirit of Chester' 47841 in 'Virgin' pictured at Rugby on the WCML.Loco recently returned to working order with DRS with no name. 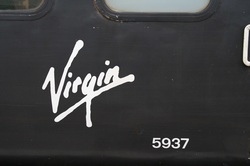 47810 still wearing 'Virgin' colours was named after the leasing company that at that time still owned it.Now seven years later Loco still operating but in the colours of DRS and now named 'Peter Bath MBE 1927-2006'.It was also named 'Captain Sensible' for a short while when in CREL ownership. 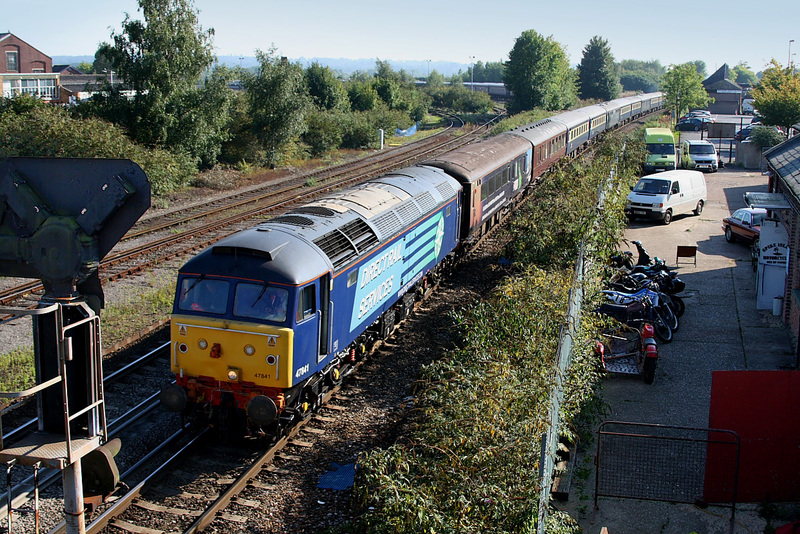 During the final few months of Class-47 operation by Freightliner they were mainly retained as 'Super-Shunters'.Here is 47309 viewed from the platform at Millbrook nr the inland Liner-Depot at Southampton shunting liner flats ready for a '66' to take them north. 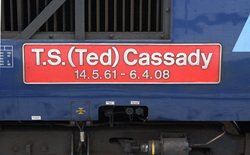 Withdrawn in jan 2006 and scrapped at T J Thompsons in feb 2009. 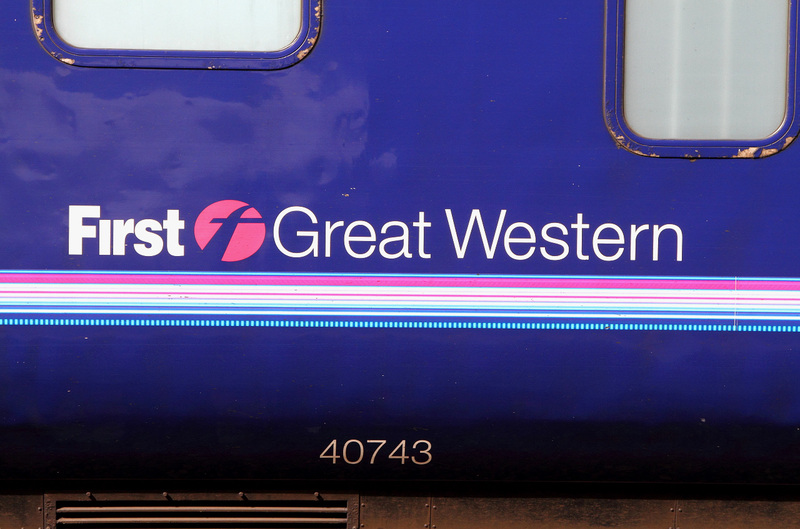 43156 seen here at Chippenham named after an establishment down near Totnes in Devon.Charges can be as high as £1220 per week so don't expect too many english children there! 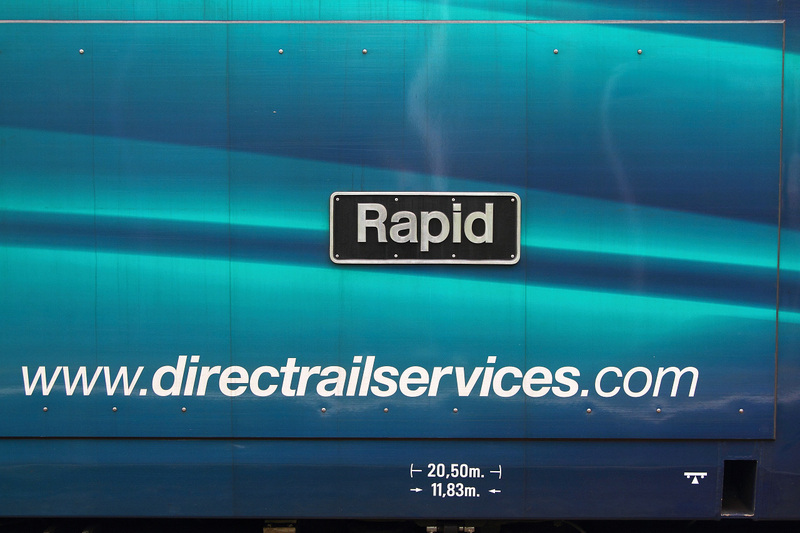 37610 seen at Gillingham in Dorset whilst on Railtrack-Test-Train duties.Direct Rail Services named this Class 37 in honour of Ted Cassady, Head of Engineering at DRS, who died recently aged 46.